It’s November 30th already, and time to bring the month to a close. 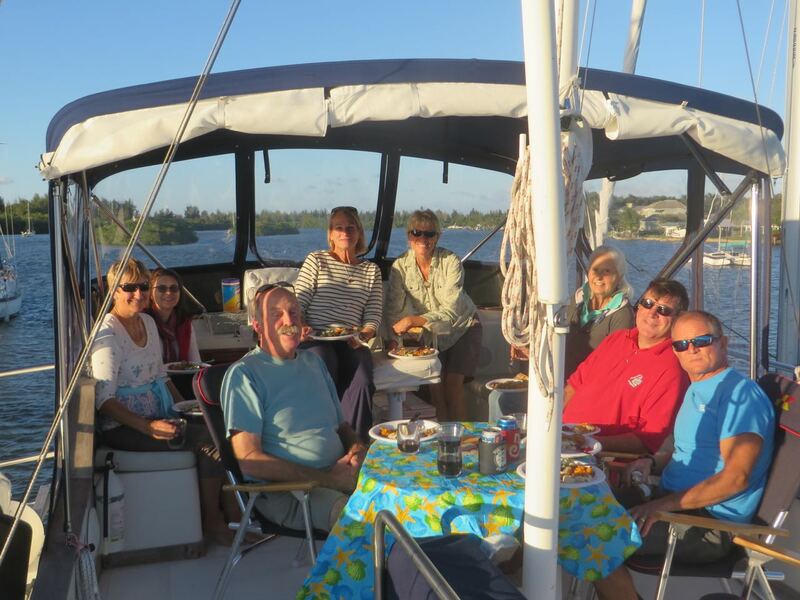 Our second week in Vero was a busy one – Thanksgiving, assorted feasting, and a lot of provisioning. 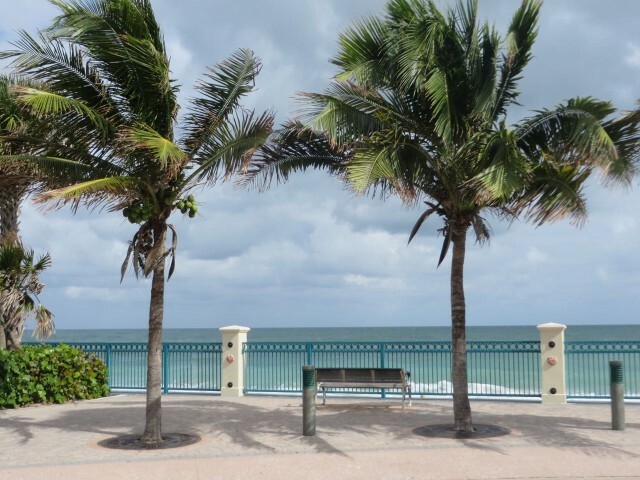 Vero Beach is also known as “Velcro Beach” because so many cruisers stop here and then never leave, or at least spend an extended time here, like the entire winter. 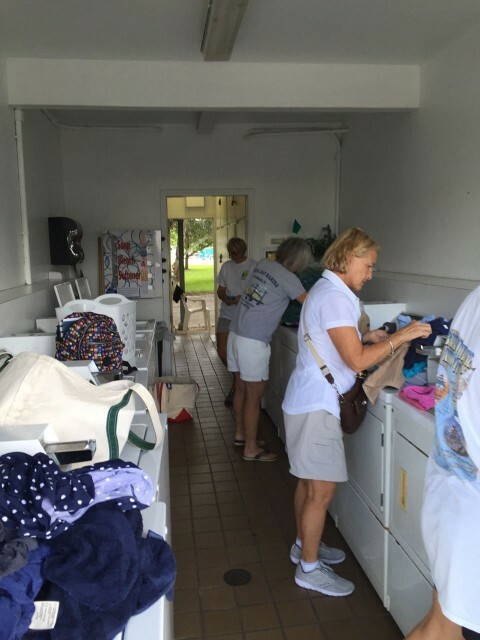 Those who do stay forever or return after cruising to settle here in a land home, are known as CLODS – “Cruisers Living On Dirt.” We spent 15 days in Vero Beach this time, and it is now time to rip free of the Velcro. Ahoy, Sam and Kayda! Our friends who live in Maine and spend the winter on their boat in the Abacos. It was so exciting to have them visit us in Vero. Our buffet table spread with foods fit for a Thanksgiving feast! 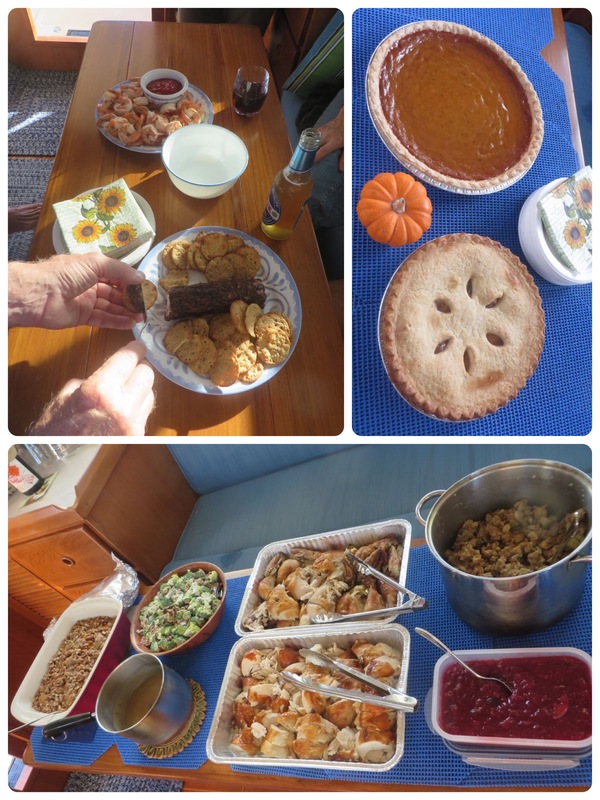 Appetizers of shrimp and fig covered cheese, Thanksgiving dinner, and pies. 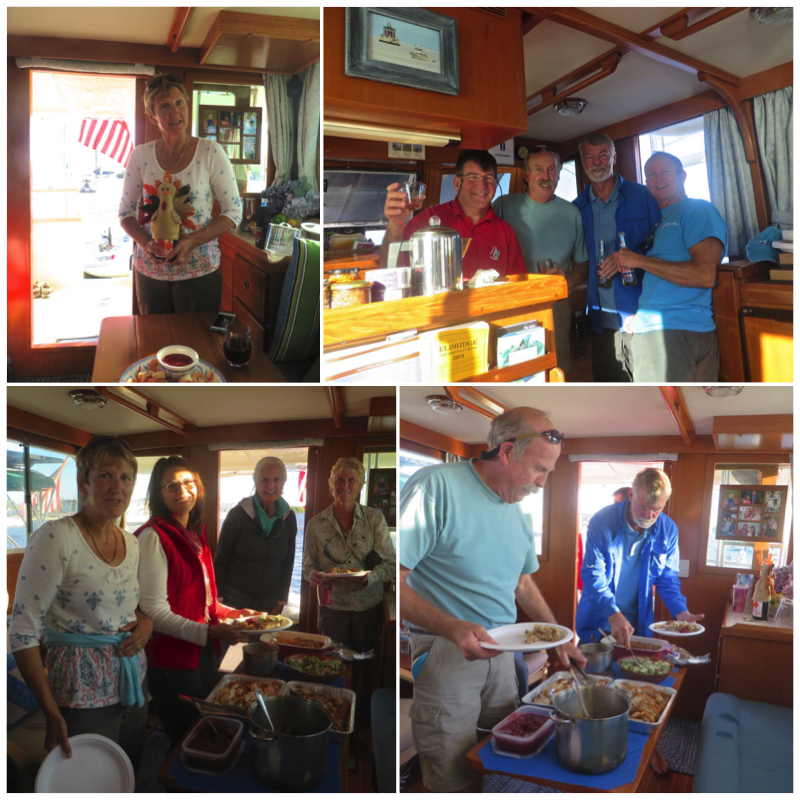 The flybridge became our dining room on this beautiful Thanksgiving Day. Since Al took the group photo above, here is a little picture of him, enjoying his Thanksgiving dinner. What a special and absolutely fun day this was! It will become one of my favorite memories of this trip. We rented a car so that we could drive across Florida and spend Thanksgiving with Al’s mother. 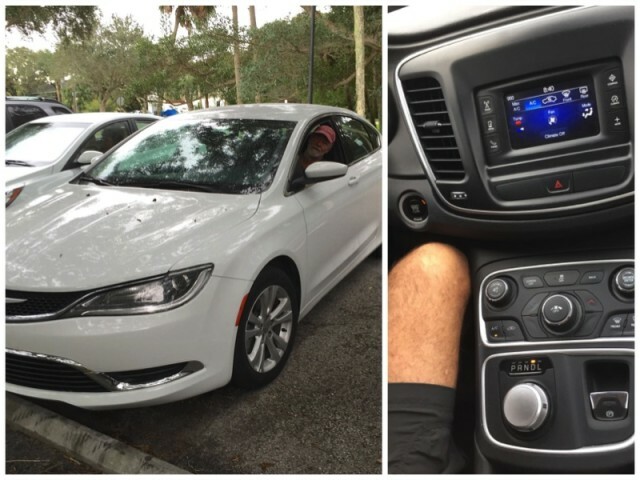 Our rental car, one of those”new-fangled” contraptions with no key, no gearshift – all push button and dials. Weird for us older folks! Top photo: Bill and Dot, Al’s mother, Bill’s Uncle Bill (who is now over 100) and us. 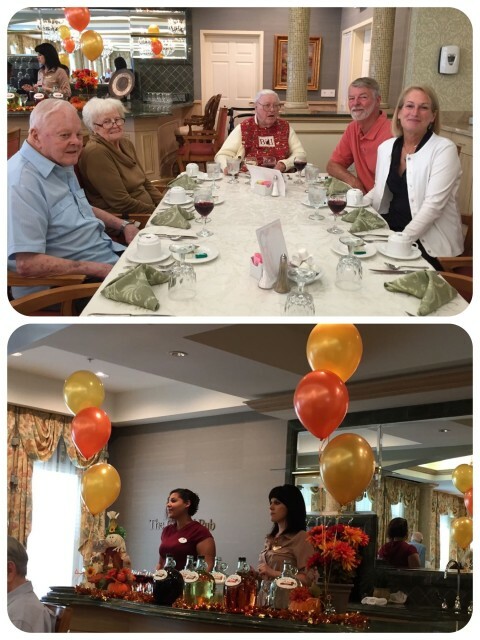 Bottom photo: The dining room was decorated very nicely for Thanksgiving. While staying in a hotel, we enjoyed every moment of unlimited hot water, television, and free wifi! A cruiser’s delight! Believe it or not, but we stayed awake until 11:00 pm one night, watching televisions and surfing the internet. 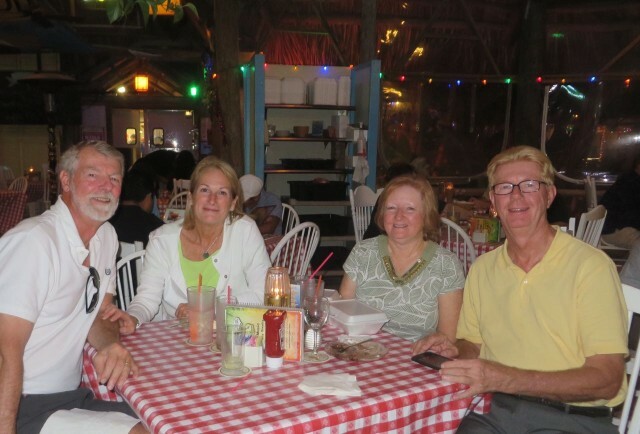 We took full advantage of having a car for a few days and drove to Jensen Beach to have dinner with Al’s brother, Bill and his wife, Barbara, at Conchy Joe’s. You bet – more feasting! The final “ing” of November is provisioning. 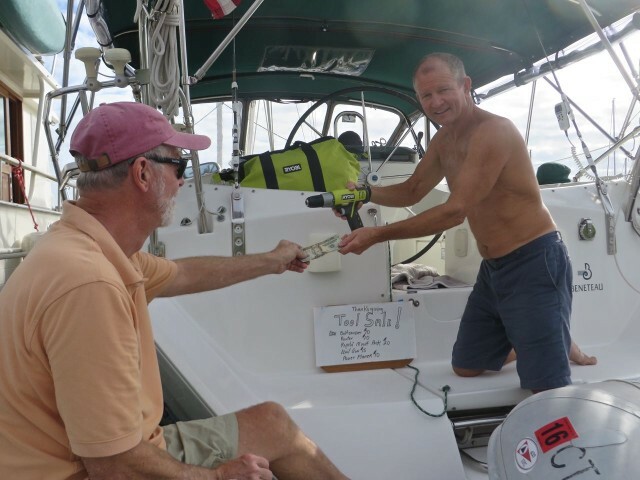 Provisoning is related to the feasting “ing” because the provisions are what allow you to feast once you depart the US and head to the Bahamas. Like most cruisers, we try to purchase all of the non-perishables we may need here in the states because it is cheaper and easier to find particular things that we want or need, such as that special coffee or cereal, or crackers and snacks, paper goods, and……..beer, which is very expensive in the Bahamas. Vero Beach was our final opportunity to do the provisioning for three months (about 16 weeks) in the Bahamas. First, there has to be an inventory of what is left. 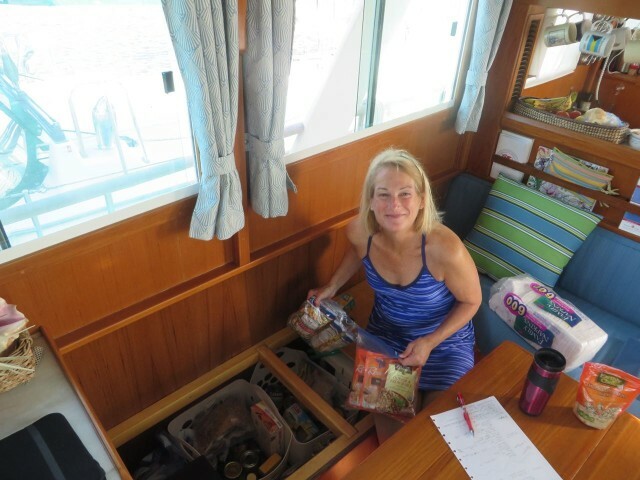 One of the rare times I will go down into the aft cockpit, that bottomless pit that we call the “basement.” We keep two plastic bins of food provisions down there. 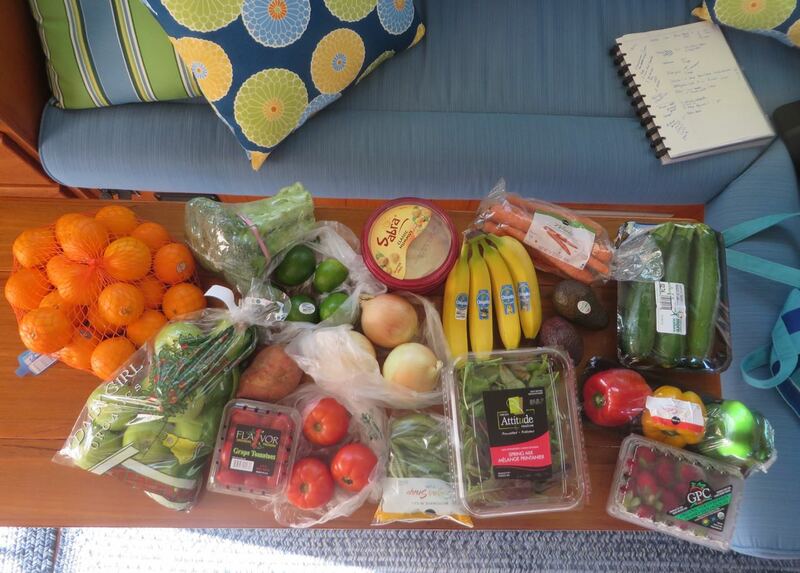 You might consider it to be our own personal grocery store. For more easily accessible food stuff, we have plastic baskets under the salon seats. 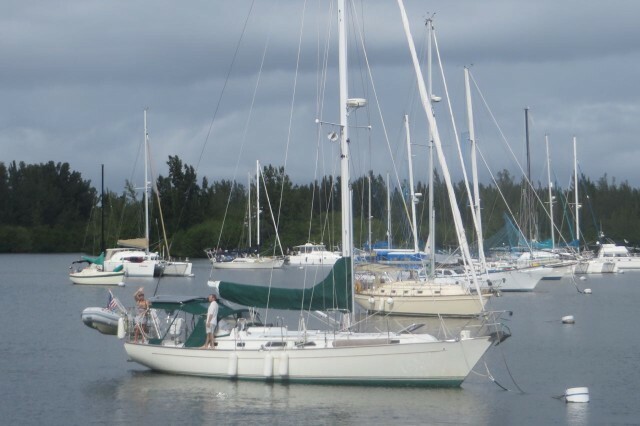 Cutting Class is carrying tools for another boating buddy who will be building a home on land. Since we have more storage space, especially under the floors, we can help out with this. Of course, Dan decided this was a perfect opportunity for a little joke. A “staged” tool sale with John’s new power tools. Dan and Al are goofing around and sent John this photo. 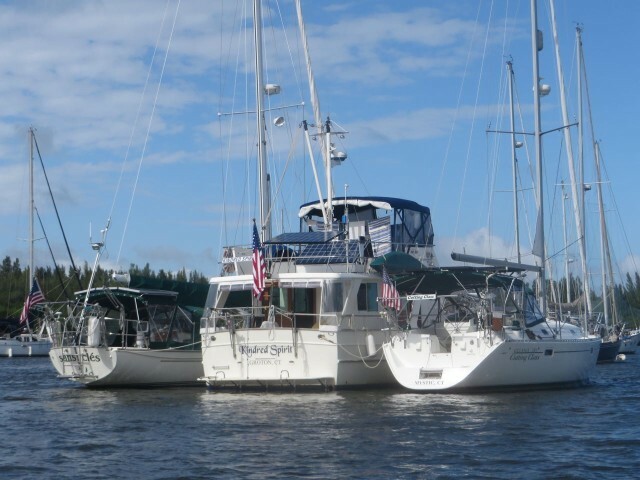 Those dear friends, Sam and Kayda drove all the way south from Maine, their home, and will be spending the winter on Solstice, their sailboat. We are helping them out as well, by carrying just a few little things like chairs, coffee, homegrown garlic, and a battery from boat to boat. Solstice needed a new battery – into the engine room it goes. And a few more items go into the “basement”. 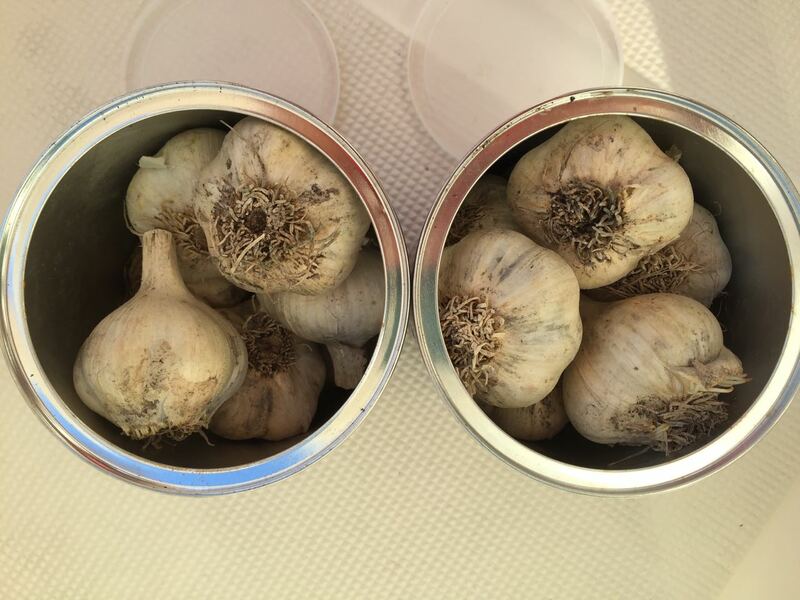 Heads of amazing homegrown garlic. One of the perks of helping is that you get to try this out. Kindred Spirit, the storage ship – We may need to change our designation on AIS from pleasure craft to barge. 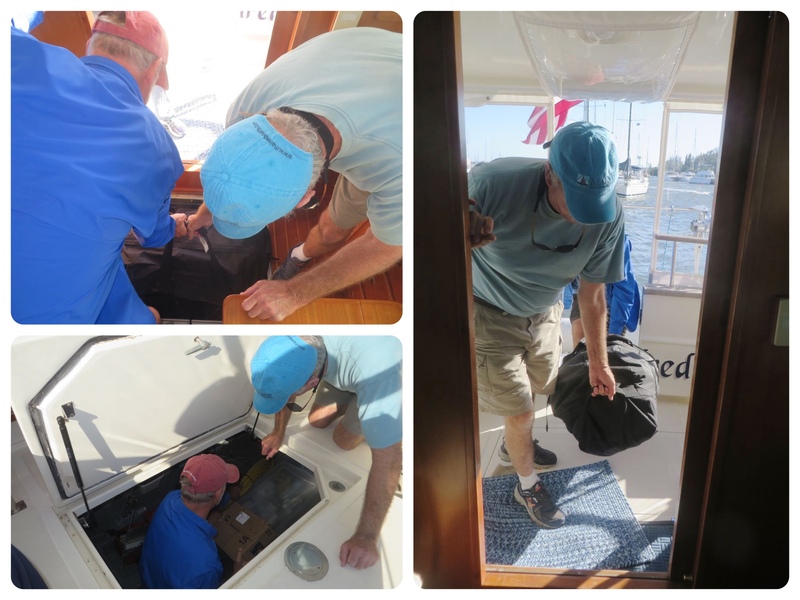 Now I know why our sailing friends have not forsaken us – our trawler has a cargo hold and can carry more stuff. 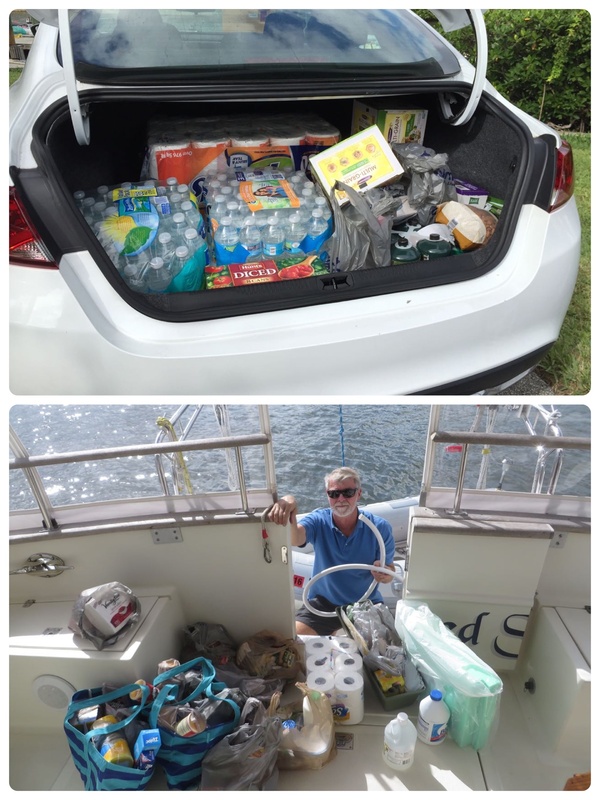 Are we loved just for our cargo space?? Back to our own provisioning. Having a rental car is perfect for the provisioning chores. It makes it so much easier than trying to shop and carry supplies for 16 weeks on foot, by bike, or by bus. Truly. We made at least three major trips with the car. 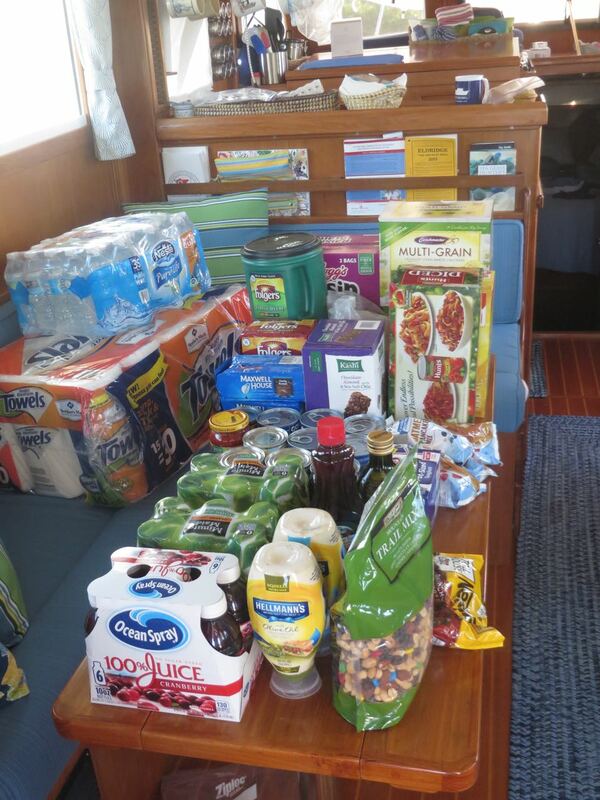 If only the shopping and carting it out to the boat were the end of provisioning. Oh no, not at all. 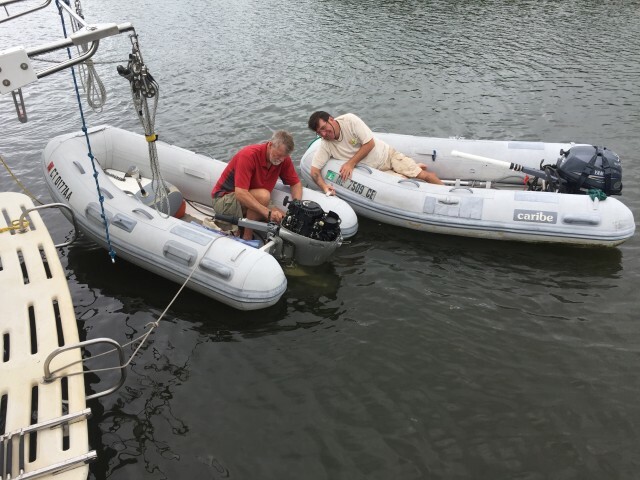 Once everything is on the boat, the fun really begins – Where, oh where is it all going to go?? From car to dinghy to cockpit. One trunk load…. 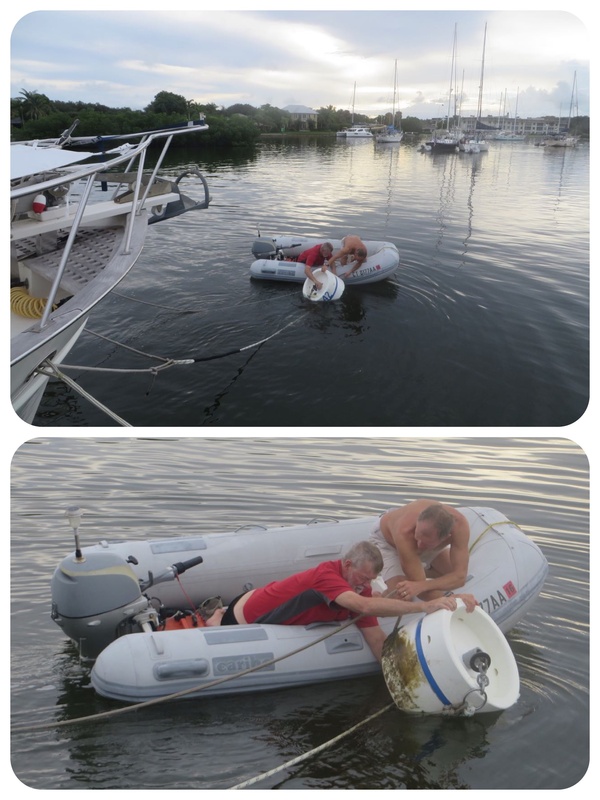 Followed by a dinghy ride to get it out to the boat. Multiply by 3. I like to lay it out first so I can see what there is and start imagining where it will go. Labeling the tops of the cans makes items easier to find and pull out when you go digging in the baskets and bins. We still have a dark chocolate problem, so here are the first 9 bags of Dove chocolates to be stored. There were 6 more bags on another shopping trip. 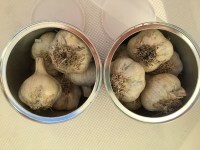 The fresh stuff – one of the final trips. More fresh items covering the top of the stove. Meats – forgot to take a pic! I learned a new trick this time. I purchased the meat we needed on one day and asked the butcher (in Publix) to separate it all into single pieces and freeze it for me. Picked it up the next day — frozen rock solid! This way our little freezer won’t have to strain and consume amps just to freeze it all. I surprised myself – it all fit into the freezer. Whew. What didn’t fit under the salon seats, in the basement bins or any other storage area was left to hang from above in the little hammocks. The oranges and apples are in the salon and the cereal and crackers are hanging in the guest cabin so that don’t get crushed. 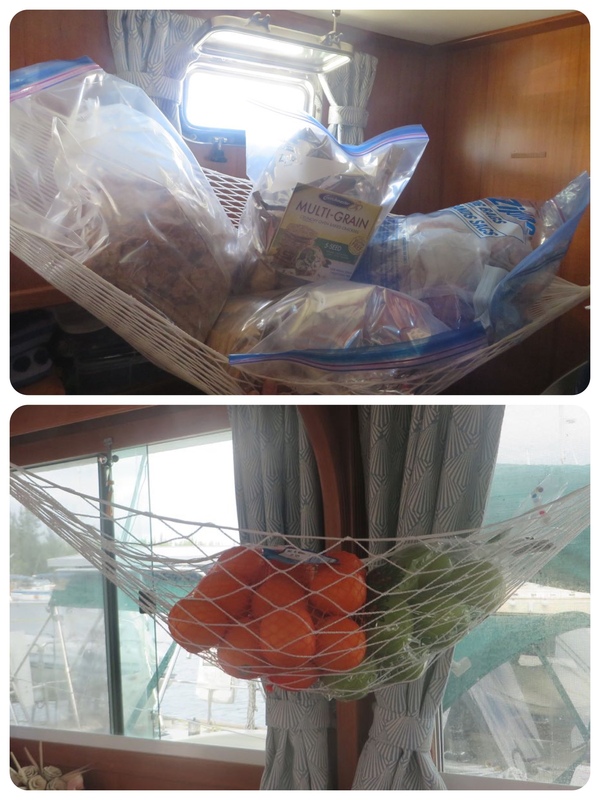 Somehow all of the provisions are stowed away, somewhere — under the salon seating, under the guest cabin bunk, under our bed, in the engine room, in plastic bins in the aft cockpit, in hammocks, in the refrigerator and in the freezer. I really , really dislike the provisioning process, I find it to be overwhelming. I know I bought too much of some things and not enough of others. I know it. There will be things we never eat and there will be things we run out of. Oh well. Provisioning decisions are really challenging for me. The only way to stop me from fretting and fussing is to just go!! There appears to be a weather window on Wednesday, December 2nd. We are planning on crossing over to the Bahamas on that day, so we left Vero Beach this morning. 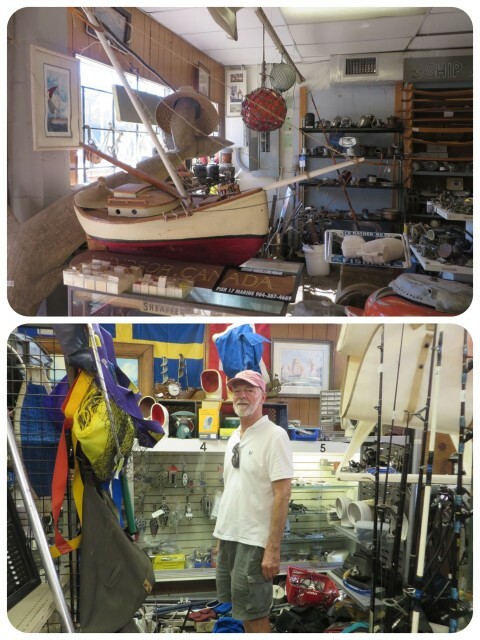 We waved good by to Sue and Dave on “san cles.” We wish them safe travels and exciting adventures. We don’t know when we might see them again because they are headed out for a few years. So, here we are, ready to go. 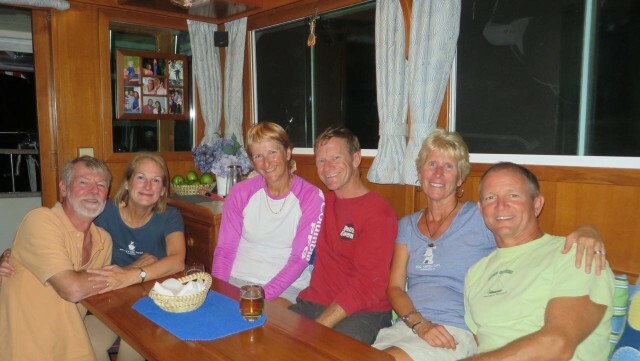 One more day to Stuart, and then we are hopefully leaving on early Wednesday morning to cross the Gulf Stream. I’m looking forward to that beautiful, clear, blue Bahamian water. 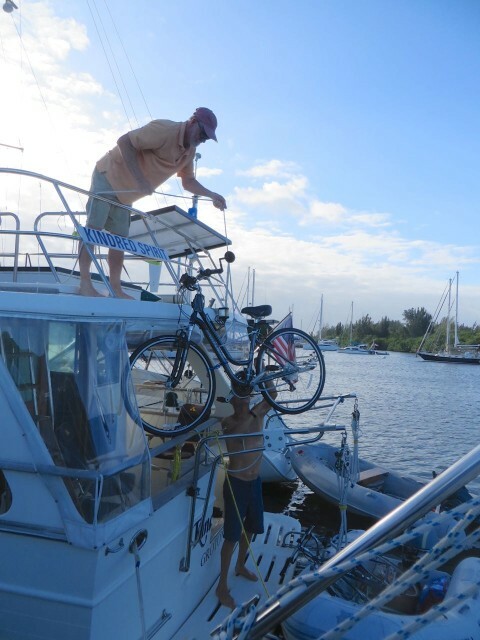 Vero Beach is a milestone for cruisers and marks the end of the long slog south. Many, many cruisers meet here before staging for the Gulf Stream crossing, and for the delicious Cruisers Potluck Thanksgiving Dinner. 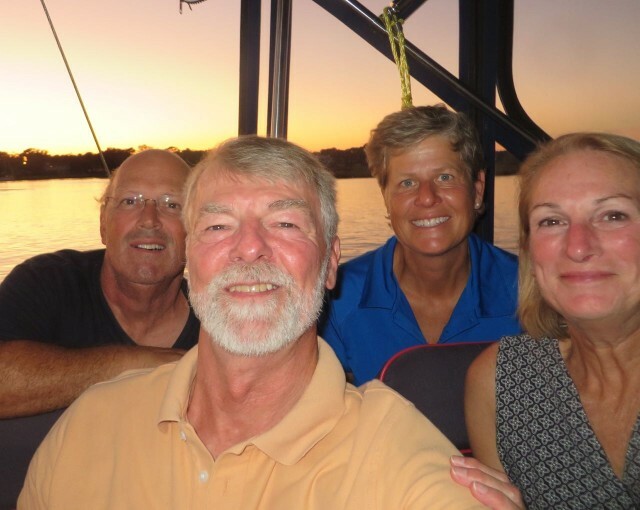 We arrived 64 days after we left Shennecossett Yacht Club in Groton and here we are rafted with our SYC buddies, after traveling almost 1300 nautical miles. 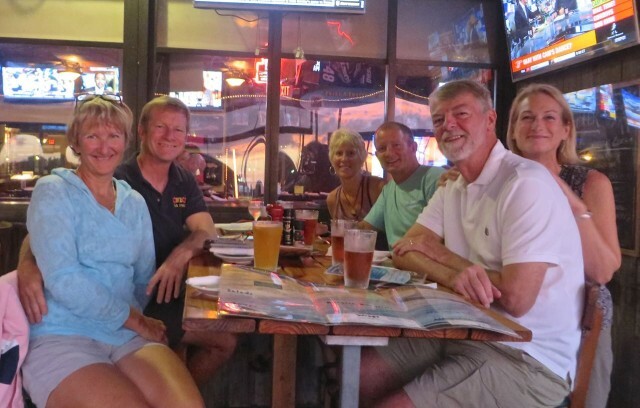 Vero Beach is an intersection for cruisers as people, to gather together and renew old friendships or make new ones. The Vero Beach City Marina’s northern mooring field. 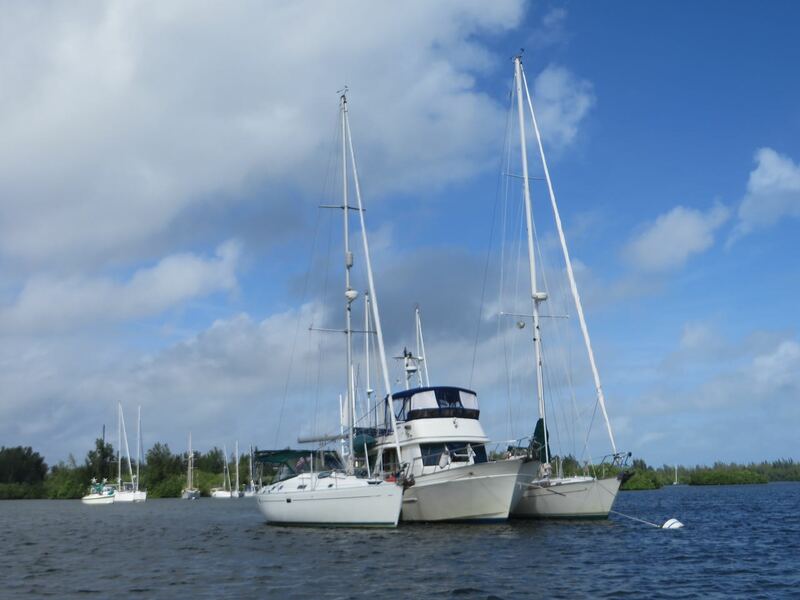 The moorings are getting crowded because it is just before Thanksgiving. You either welcome new friends to raft or you arrange to raft together with old friends. Just like 2013, we had our own little Shennecossett YC reunion – Cutting Class, san cles, and us, Kindred Spirit. 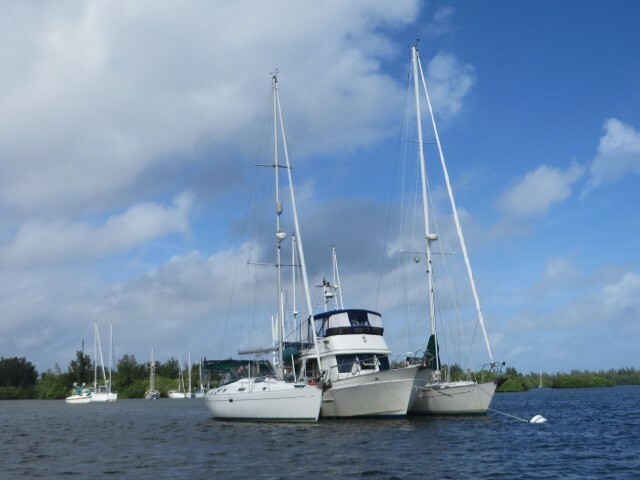 This time our SYC rendesvouz has a different profile with our trawler in the middle of the two sailboats. We may have the distinction of being the only “mixed” raft up. That’s what true friendship is. The aft view of our mooring raft up — A Kindred Spirit sandwich! 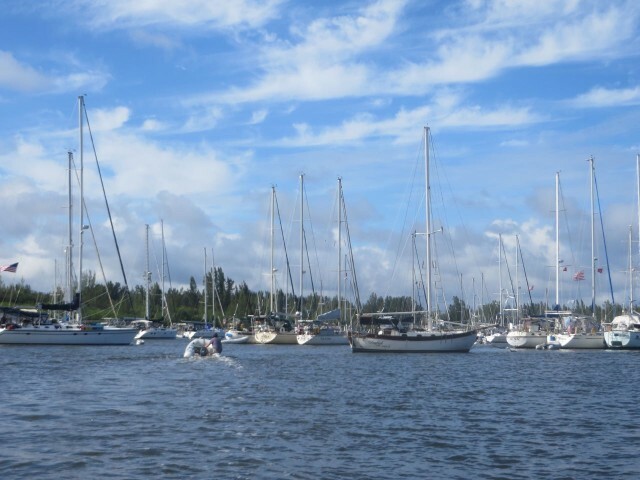 Our bow view – It’s easy to pick out our little raft-up. Hanging out in Vero Beach gives us a chance to catch our breath. 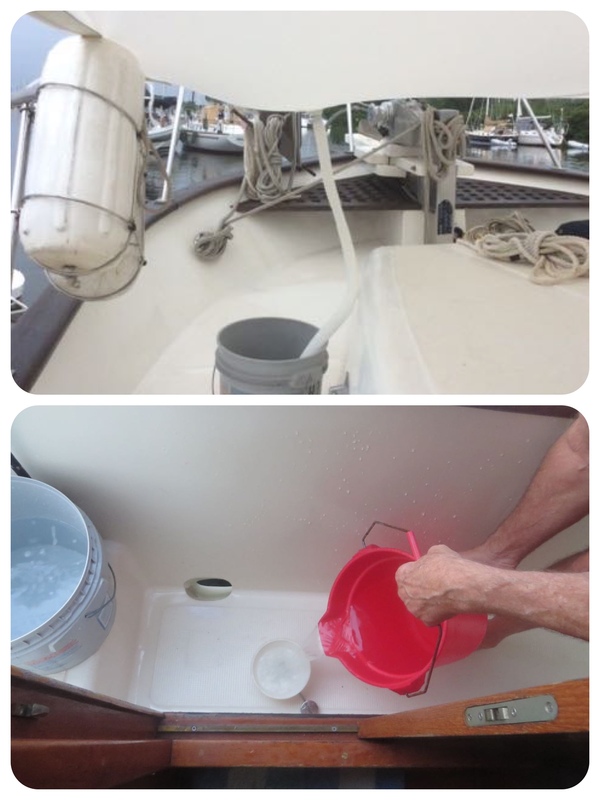 We mix our social times with chores and maintenance tasks. Our first week here was mixed with sun, plenty of rain showers and humidity that was way too high. Thank goodness there are things to do and people to play with. 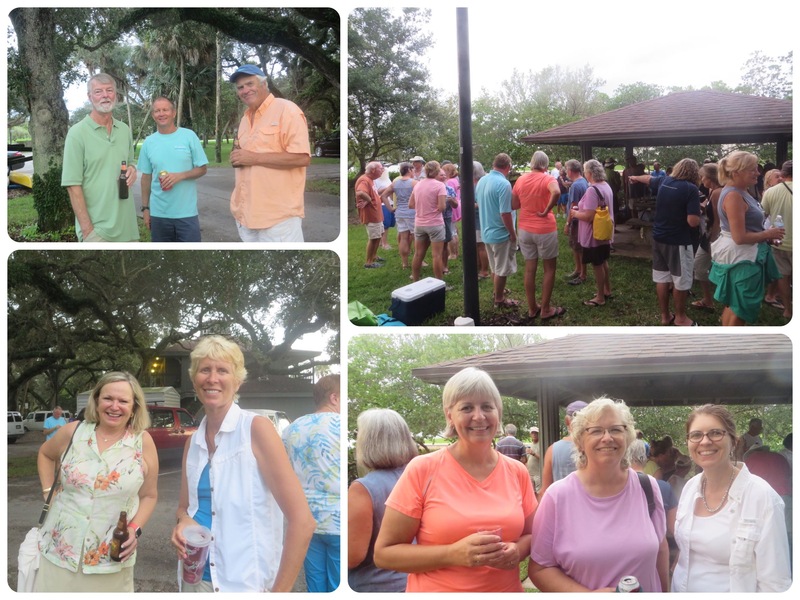 The SYC crowd at Riverside Cafe enjoying the beers and food on the outside deck……….in the rain! Under an overhang. Sue and Dave, Marcia and Dan, and us. Lots of fish hanging around and swimming about just off the restaurant’s deck. Looking for treats? Our beach time has been limited. 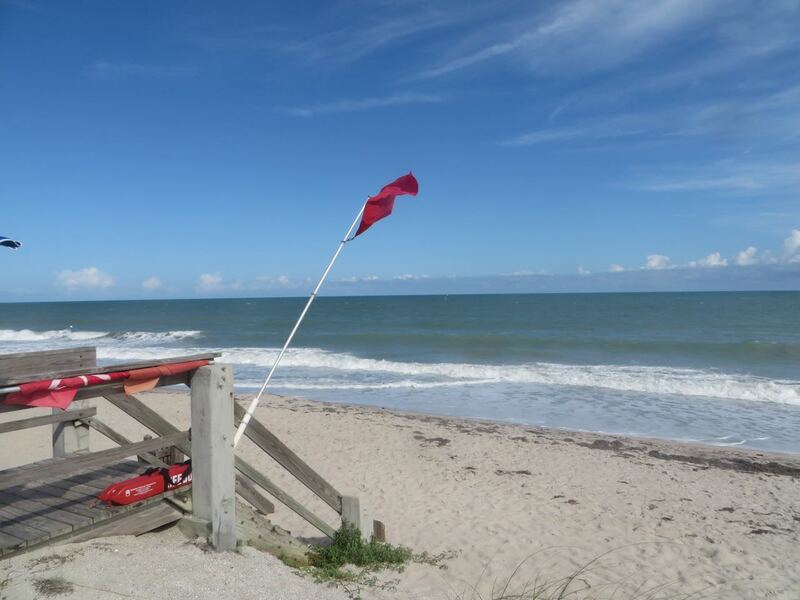 It is either raining or too rough in the water – This time there was still a RED flag warning on the lifeguard stand although the water had calmed down significantly. Much to my surprise, Al decides to take a dip in the ocean! 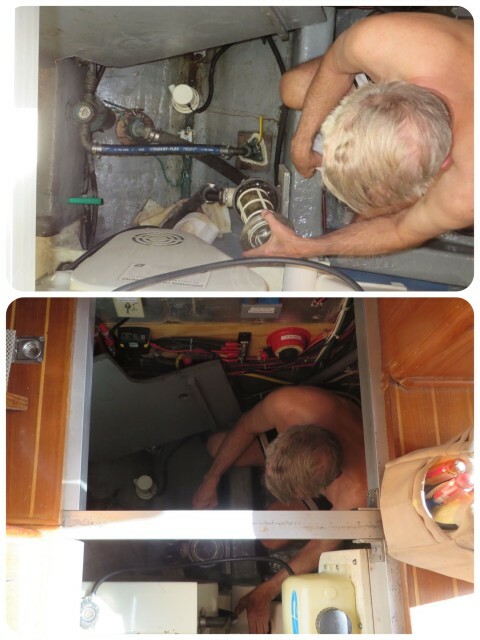 This man likes his water on the warm side, so the Florida water called to him. 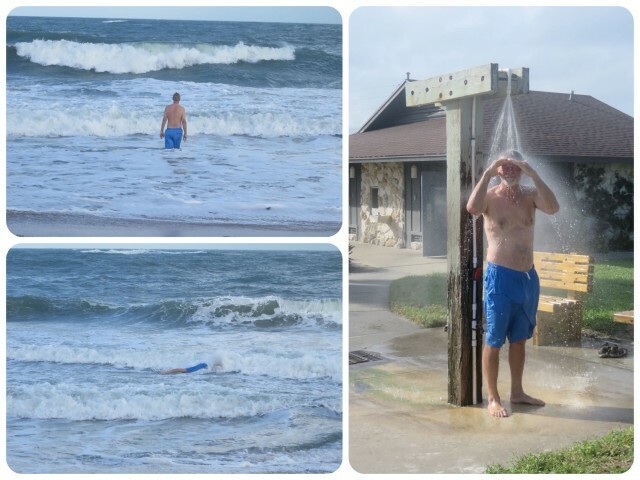 A nice cool shower right at the beach cleaned the sand and salt off. 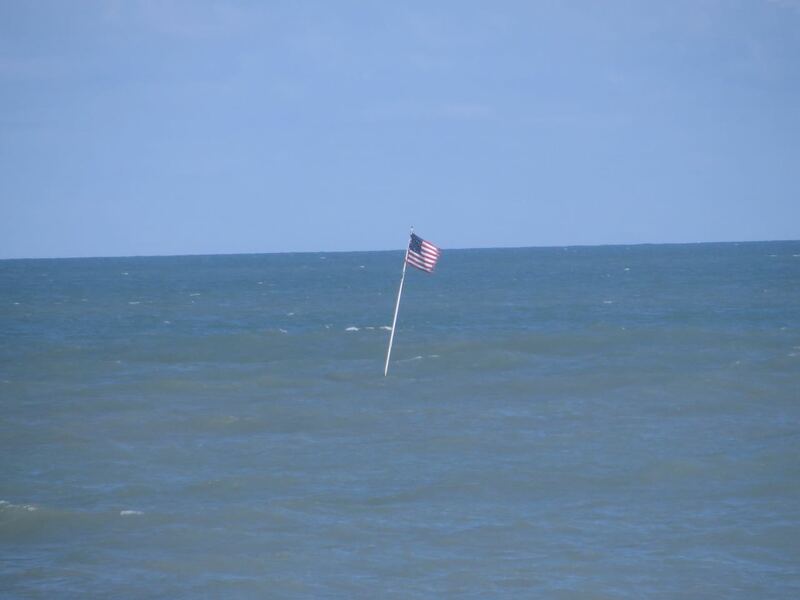 We spied this American flag flying out in the water off the Vero beach. 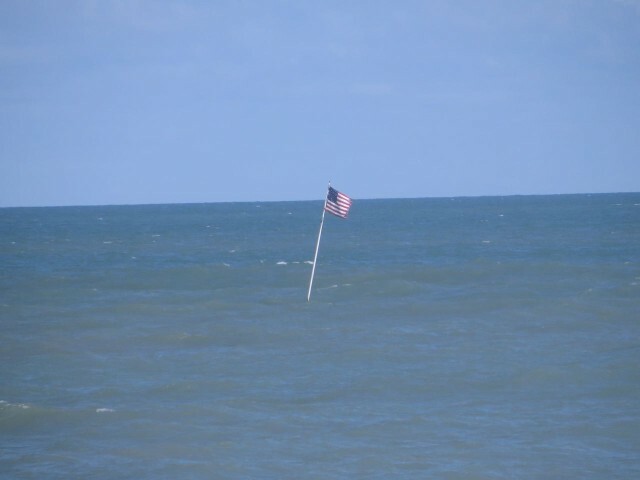 We pondered the possible significance of this flag that was attached to …..what??? Once again, my curiosity was quenched by Google and I found the story here. On a trawler everyone can fit in the engine room — Dan and Al in the engine room solving an electrical problem. 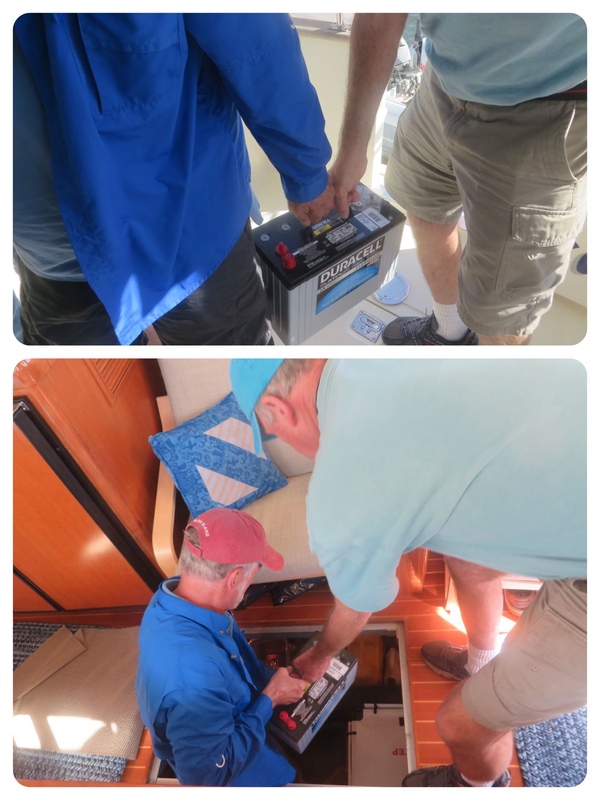 We noticed that our anchor light and steaming lights were acting strangely, as in not going on when the switch is flipped or going on when the wrong switch is flipped. This problem is what we call “ball wrap.” Over time, as boats swing about on a mooring the lines can get wrapped under the mooring ball. Al and Dan are untwisting it. Al helped Dan design a method for holding the bimini windows up – snaps to the rescue. Al loves using his snapping tools. 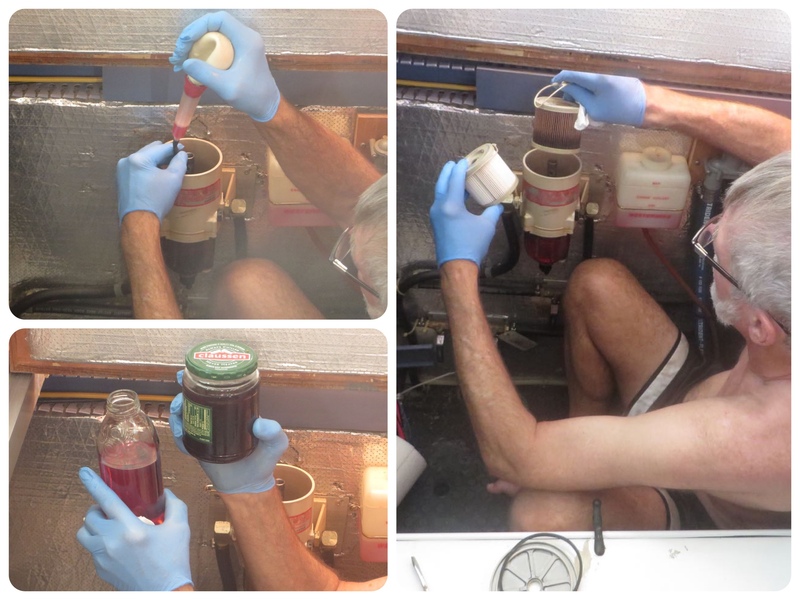 Checking and cleaning the fuel filter on the engine. Yup – down in that engine room again. 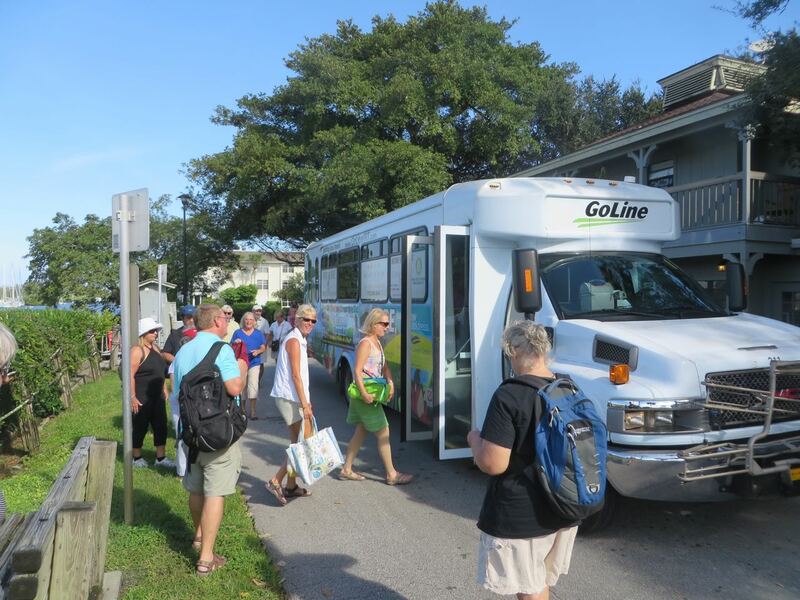 Vero Beach has a free bus that comes right by the marina. Perfect for a trip to Public to grocery shop, or to TJ Maxx, the Dollar Store, West Marine, and more. That’s one of my chores – the grocery shopping. 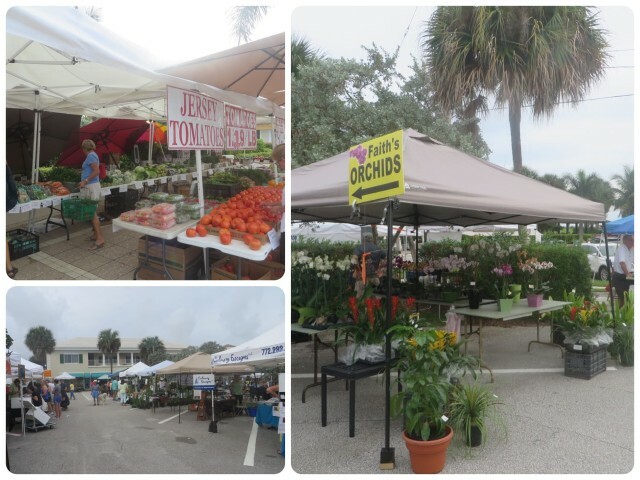 The Saturday morning Farmers Market was quite nice and just an easy bike ride away. More shopping, of course. What can I say? Laundry has to be done. Sharing washers and dryers with other desperate cruisers is a real challenge! But it is also a good place to meet other folks. Cooking is my most significant contribution on this adventure. 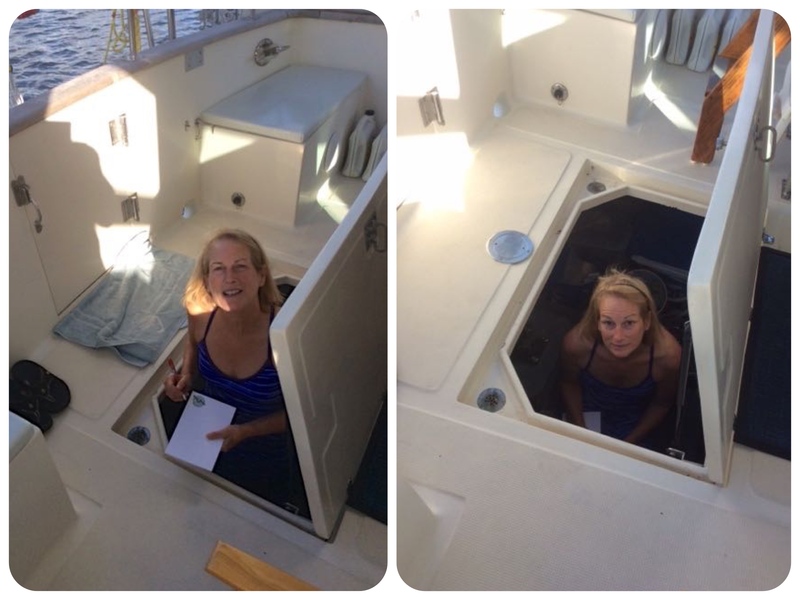 I don’t let anyone else in my galley (Seriously, that’s because there is only room for one person!) Here I am pouring the morning coffee and making apple-raspberry pancakes. 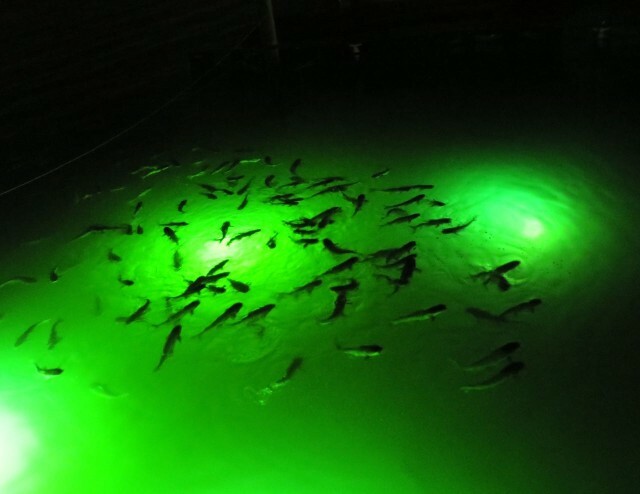 Every surface is covered with some part of the production. 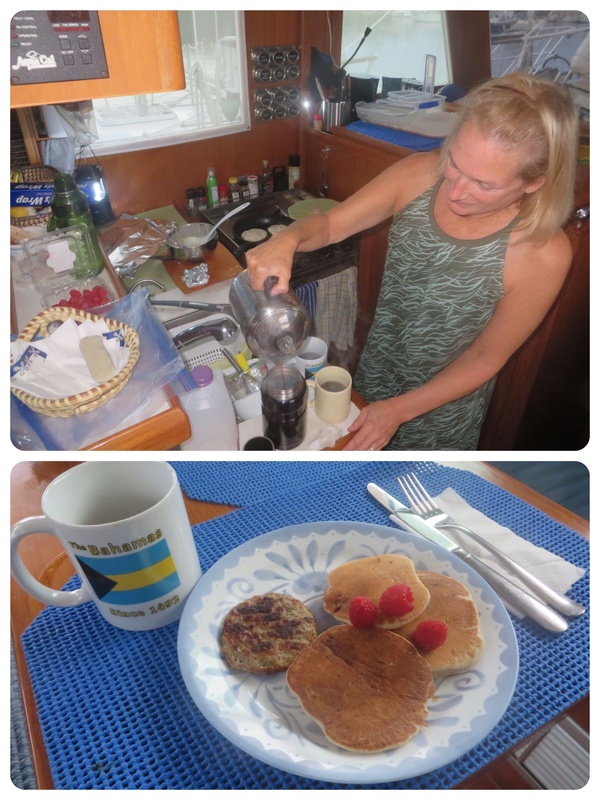 Some day I should do a step-by-step on how I cook in the little galley. Sunset over the mooring field. The mooring field before dawn. One of my favorite times of the day. 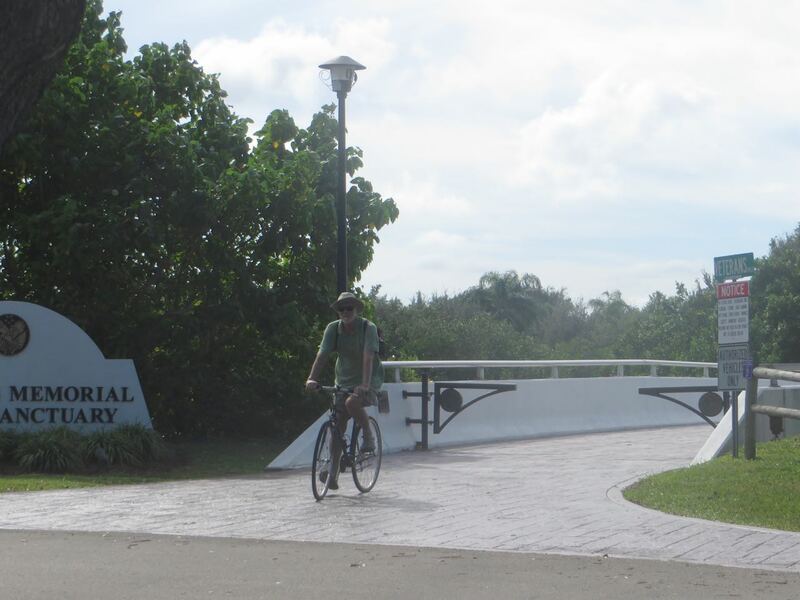 Vero Beach is a perfect place to use our bikes, especially since we will be here for a couple of weeks. There’s plenty of places to go to and plenty to see. 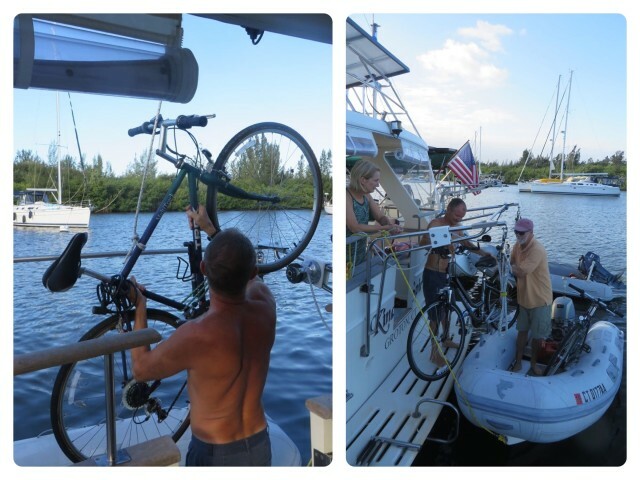 It is still an event to get the bikes into the dinghy and to the shore. The bikes go into the dink. 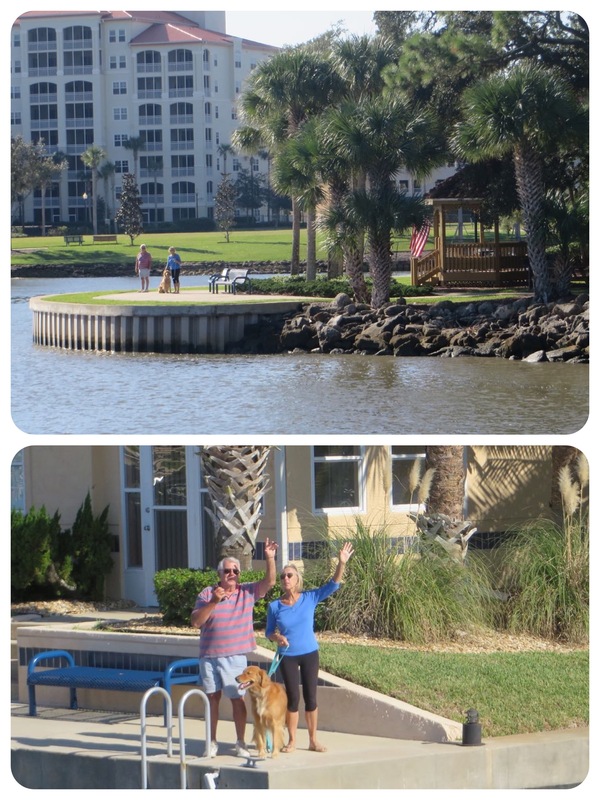 Vero is an easy place for biking – nice and flat. We biked to the park, to the beach, the ice cream shop, to CVS, to the Farmers Market. One of several lovely park settings with benches and palm trees, with a view of the beach and ocean. Florida is covered in beautiful trees, shrubs, and flowers. When riding the bikes we deliberately take the roads through neighborhoods. 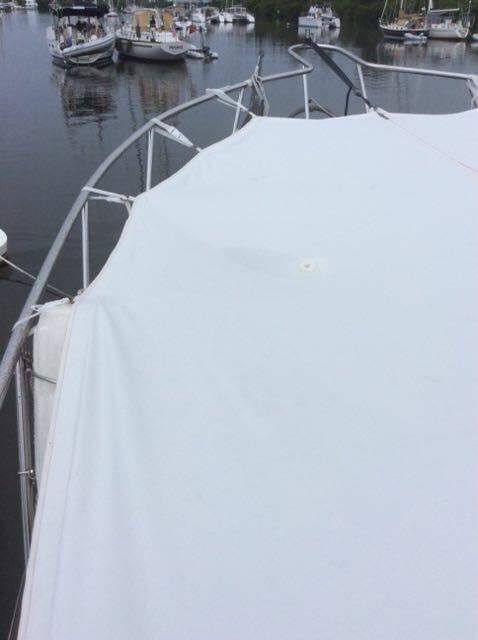 The sunshade over the bow of the boat — Water collected on it making it necessary to add a hole for the water to drain before the added weight ripped the cover. You might be able to see the hole if you look closely. The water goes into the bucket and in the morning after the night time rain showers (or downpours), we have 10 extra gallons of water that gets pored into the tanks. Next step – a longer hose so that it goes directly into the tanks. This is going to be awesome in the Bahamas. If it rains. Every Thursday is Cruisers Happy Hour on the marina grounds. Everyone gathers and shares food, drinks, and lots of stories. A great way to meet new people and re-meet people from previous trips. 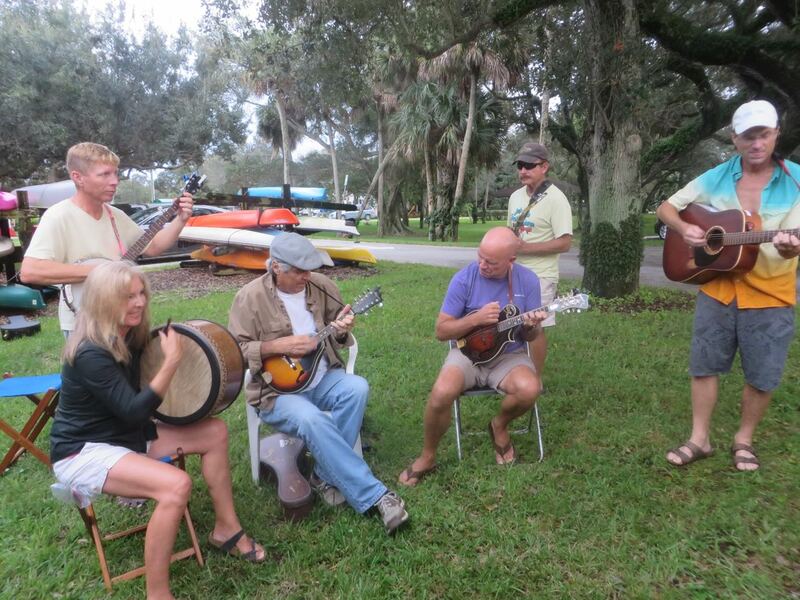 When the crew of Salty Paws is here, they arrange for the talented people to play music. Delightful! 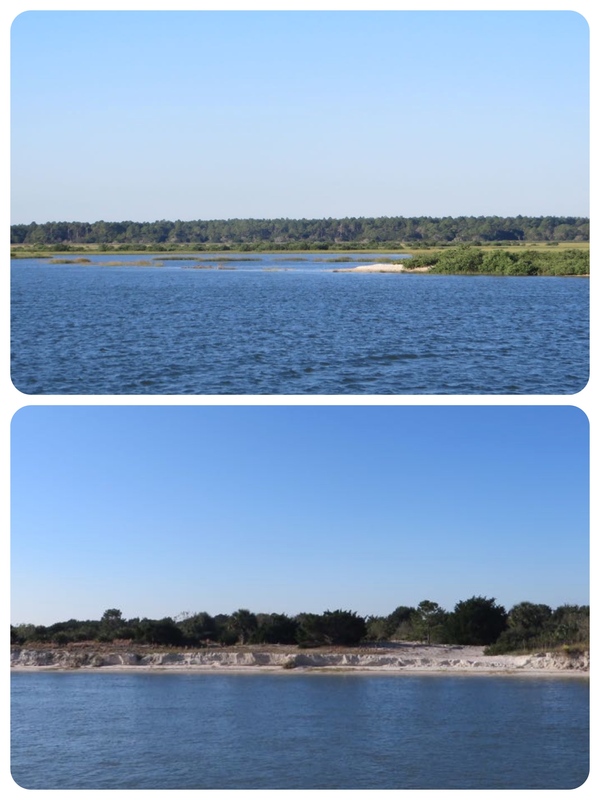 When we awoke in St. Augustine, a little later in the morning of the dreaded fog experience, the channel looked entirely different. I would have said “easy-peasy” if it had been daylight! A view out the St. Augustine inlet later in the morning, minus the fog. What a difference! 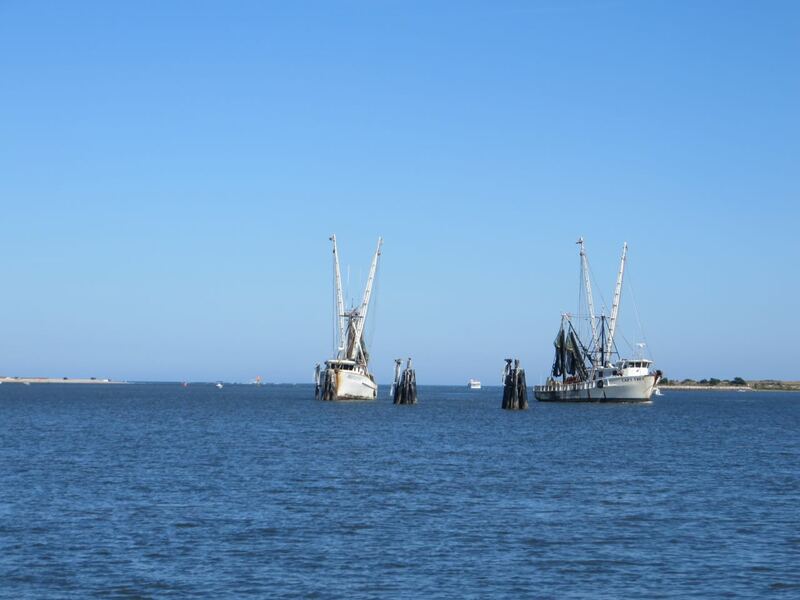 The shrimpers tie up to these “dolphins” (no, I don’t know why they are called dolphins) to wait for the Bridge of Lions to open. We were anchored off of two famous St. Augustine sights. 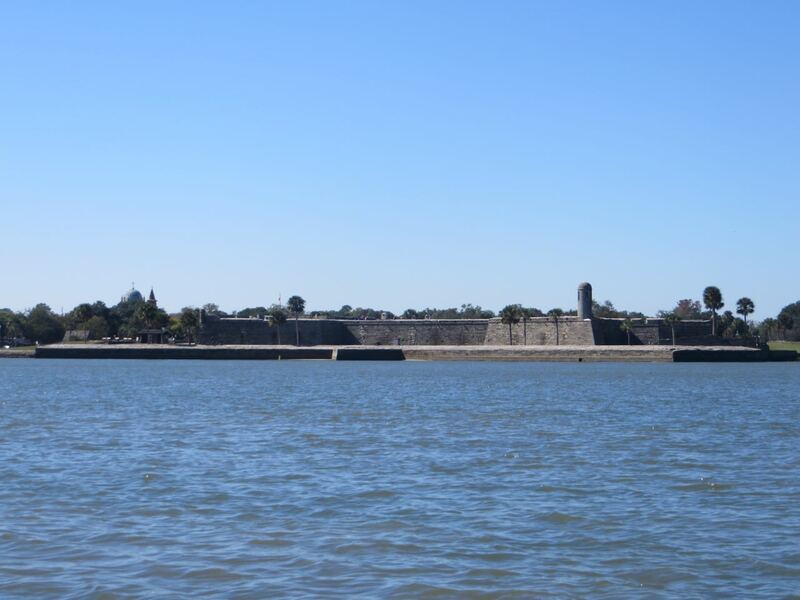 Castillo de San Marcos, the fort. 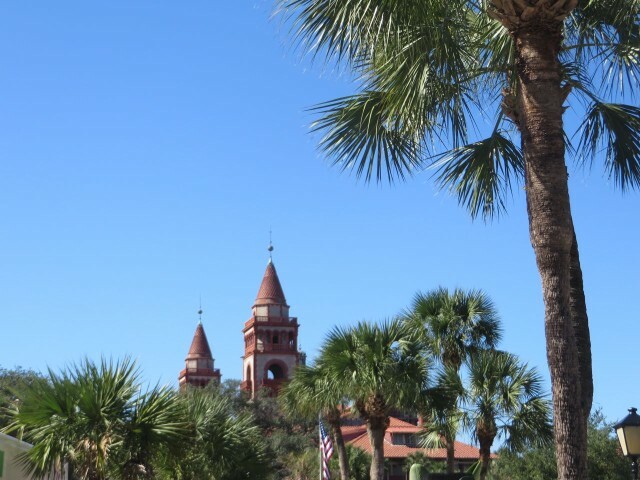 The top of Flagler College. We fondly remembered our tour of the college. Fascinating architecture. Cruising buddies always talk about the Sailors Exchange, so we walked to the other side of the city to check it out for ourselves. A consignment marine shop – boat stuff everywhere!!! I had my eye on that orange Japanese glass float hanging from the ceiling (top picture). Sure would look nice displayed with my other ones at home………. No can do –storage issues. Remember Hi-Flite, the welcoming vision that arose out of the fog as we anchored nearby? We compared voyages so far and future plans at our own little happy hour. We had met Cori and Dale this past summer at a picnic in Connecticut. 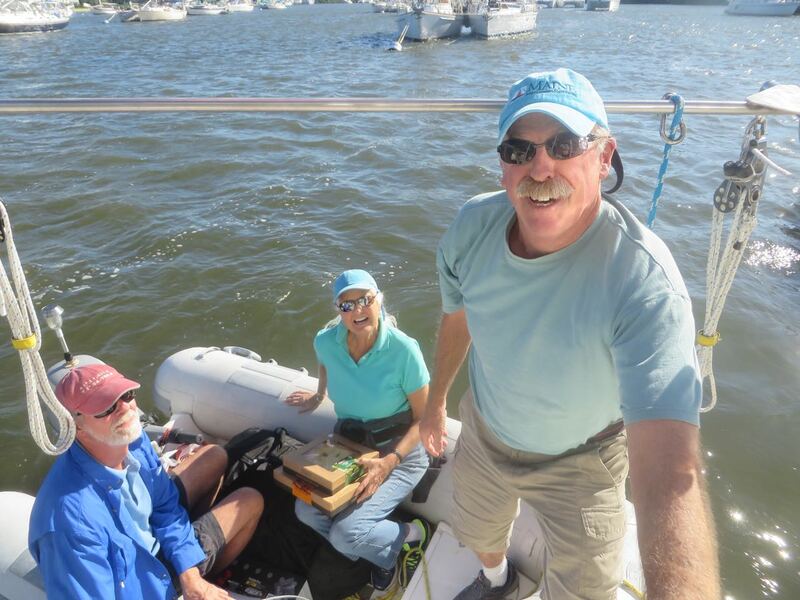 They live aboard Hi-Flite and were cruising our New England waters. Group selfie of Dale, Al, Cori, and me. Cori makes the most delicious caramels I have ever tasted – they should be illegal based on their addictive nature. She gave us some. 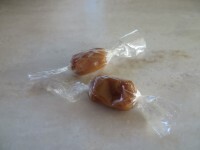 Al only had one because I hid the others and ate them all myself. Is it possible that this could replace my Dove chocolates addiction???? We pulled up anchor at first light and nearly had our first fight of the entire voyage. 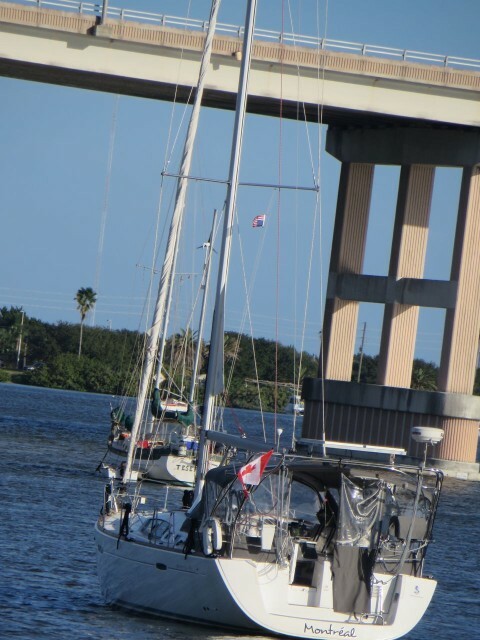 Bridges can cause anxiety, but I thought those days were over now that we no longer have that big 58-foot stick (translate for dirt dwellers – mast on sailboat.) 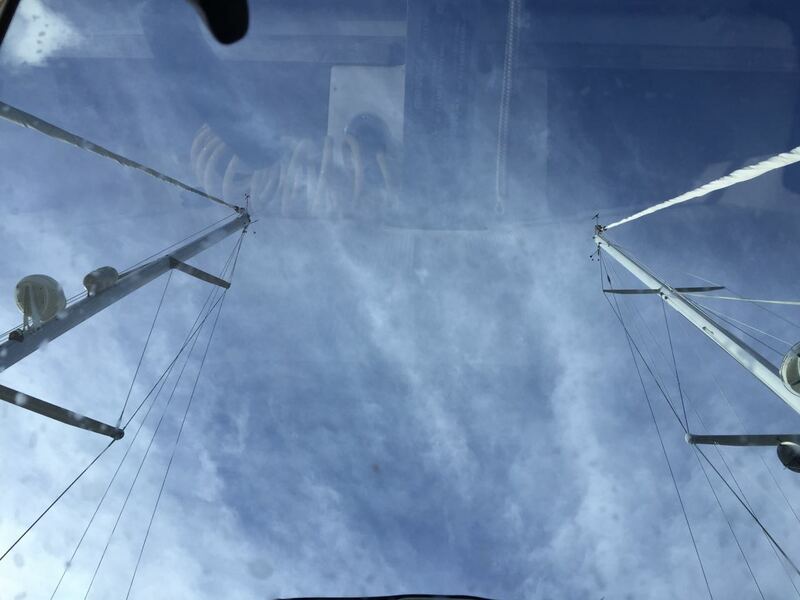 On the other hand, there can be more anxiety with the trawler because we now check the height of the bascule and swing bridges to see if we fill fit underneath without requesting an opening. 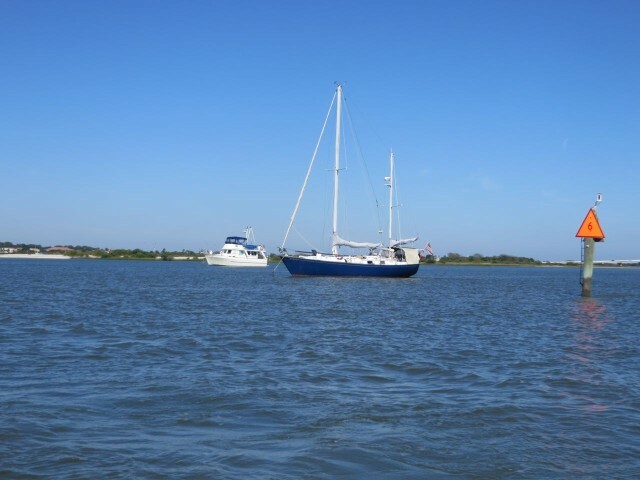 With a sailboat there was no question and no “discussion” – you waited for the opening. We missed the 7:00 am opening for the Bridge of Lions, officially listed as a 25 foot clearance. The Captain assured the Admiral (me) we could fit under the bridge. 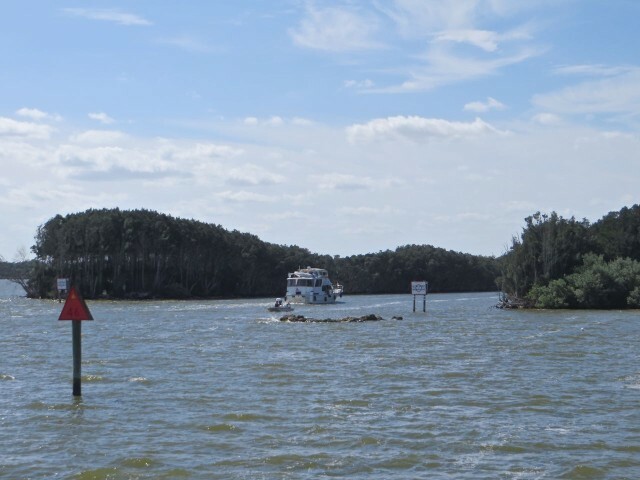 But the water was high, so as we approached, I took a photo with my camera and zoomed in on the picture so that I could read the board – No way, Captain!! 18 feet plus 4 more feet at the center equals 22 feet. 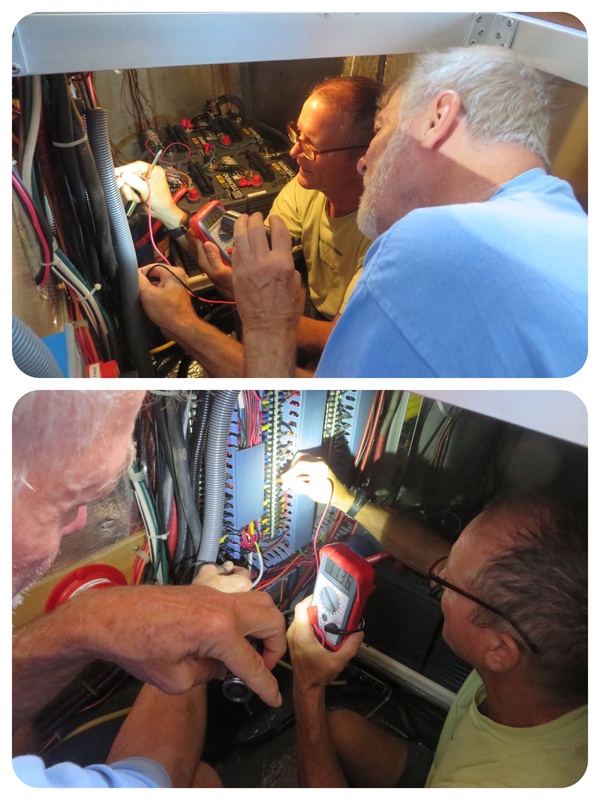 We had measured and made a note on the flybridge that we needed 24 feet. 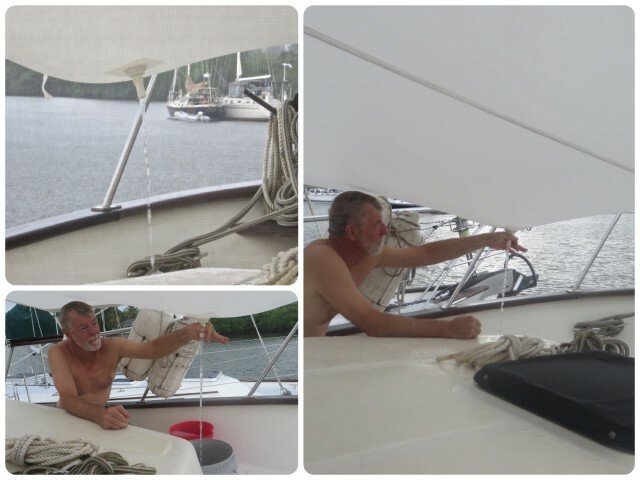 The Captain tells the Admiral that our 24 feet includes a “buffer foot.” We will be ok – just watch as we get closer so that he can quickly turn about if it doesn’t look possible. The Admiral was not happy, 23 feet is still more than 22 feet. In the end, we were ok, IF you do not mind hearing your antennae scrape along the underside of a bridge. That’s a close call of the closest kind. Hindsight: I misread the board – it was actually 19 feet plus the 4 feet, equaling 23 feet. I declared that since the Captain had made his decision based on the information given, he was still wrong. Just lucky that my information was off by a foot!! In the early morning light, it is easy to think the board read 18 feet instead of 19 feet. Isn’t it? ?The little tiny line below 17 is the 18 foot mark. 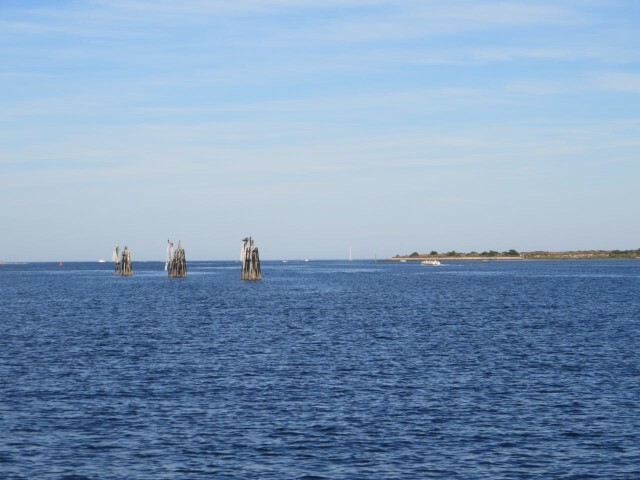 The water is actually at 19 feet, but I could only see the top of the 19 which could look like 18 feet…………….. Anyway, we kissed and made up, and continued on. 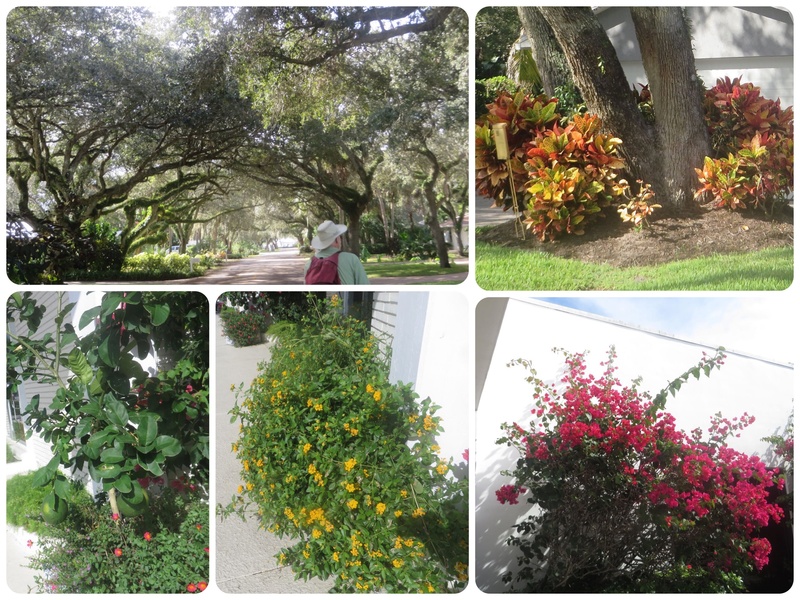 We were on our way to Vero Beach for Thanksgiving. 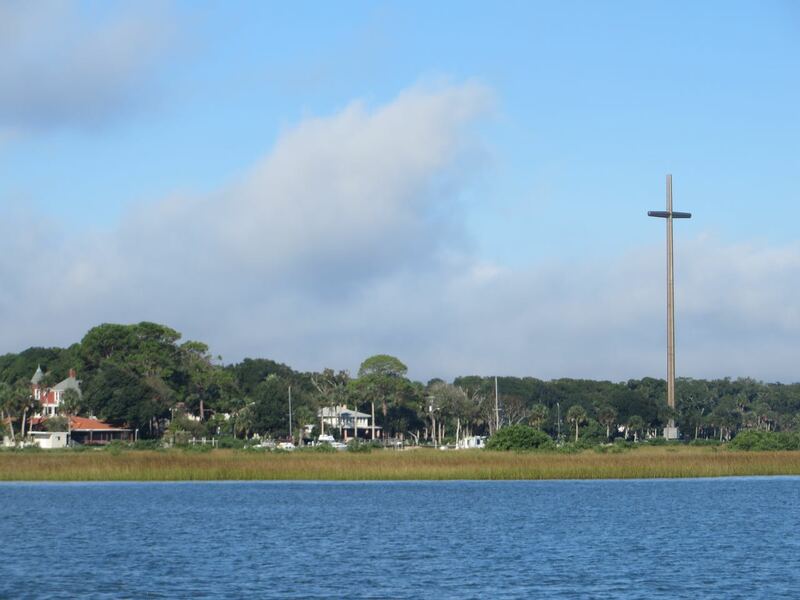 From St. Augustine, that would take 3 days of 5-10 hours each day of traveling in Florida’s ICW. 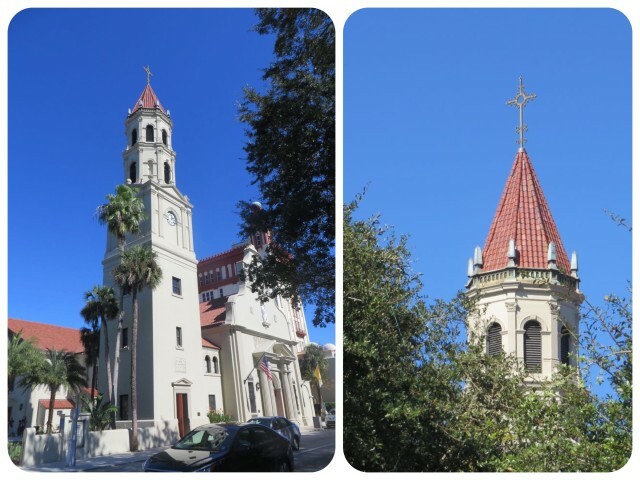 St. Augustine to Daytona. Daytona to Cocoa. Cocoa to Vero Beach. The plan was to anchor at Daytona Beach for the night. Speaking of bridges, we passed below or through quite a few over these three days. Some high, some low, some just right. 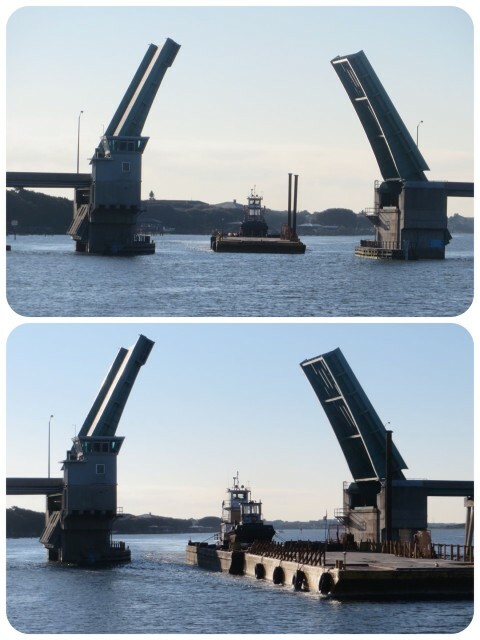 It doesn’t matter what the height is for this bridge! When a barge is coming through, you wait. Barges have first dibs. 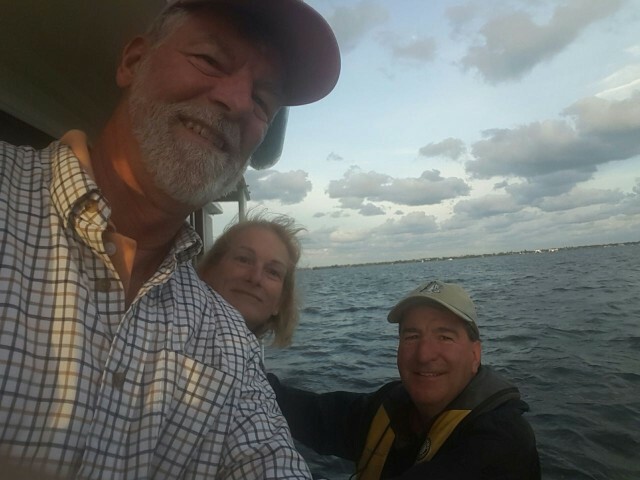 Al got an email from our Bahama friends, Bruce and Tracy, who now live in Florida – perfect timing! 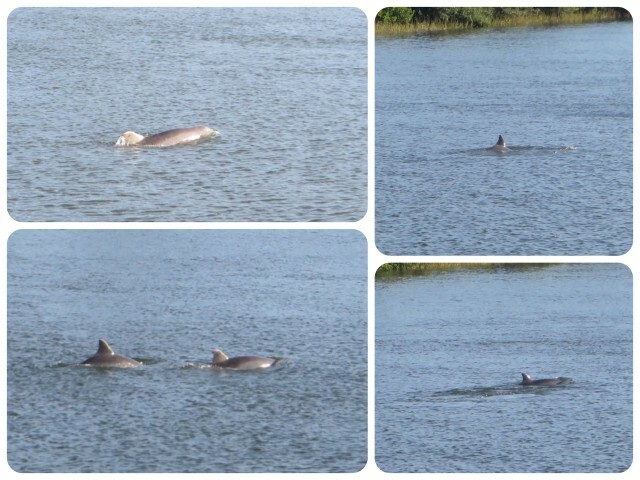 As we passed their condo, which is directly on the ICW, they came out to wave. Their trawler, Miss Maggie lives at a dock just behind their building. What more could you want?? Have to say that it was so neat to have friends come out to wave to us!! Bruce, Tracy, and Maggie May. 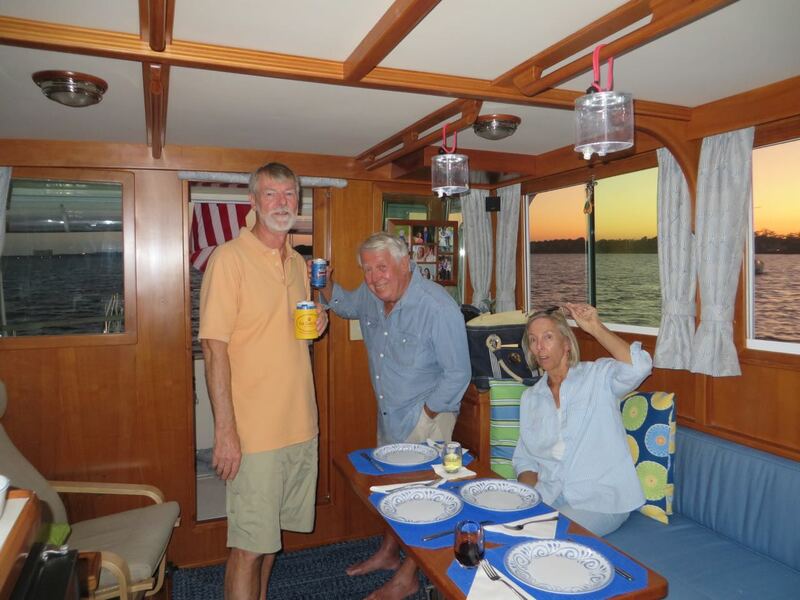 Dinner guests on Kindred Spirit. What an enjoyable evening we all had catching up our news. 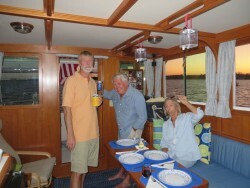 We made arrangements to have dinner together on board Kindred Spirit that evening in Daytona. 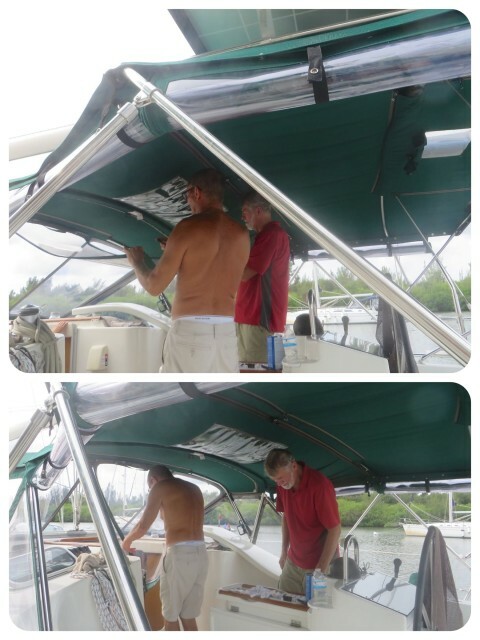 Although it took us several more hours to reach the anchorage, it was only a 30-minute drive for Bruce and Tracy. On our way south to Daytona, we enjoyed passing under the 65-foot highway bridge, Broadway Bridge (also known as Speedway Bridge) again. This bridge is a bridge with flair and style. 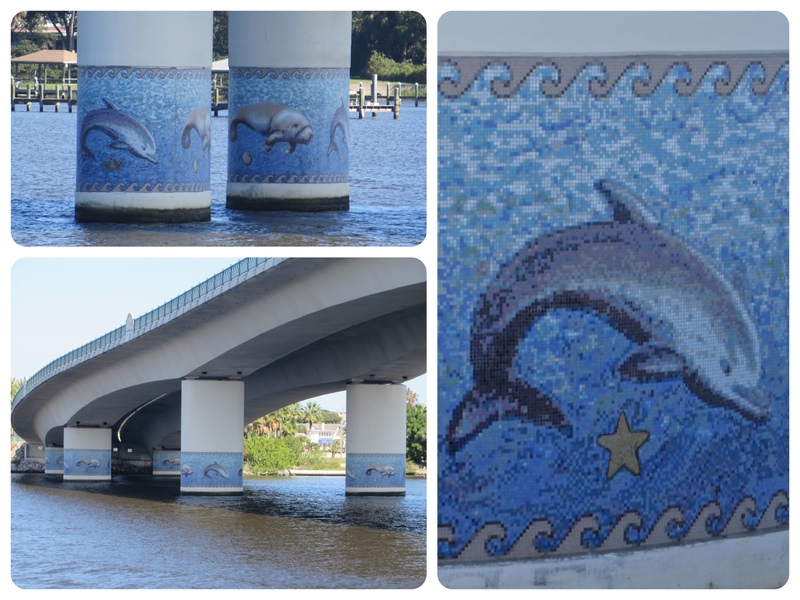 The artwork on the bridge supports is made of mosaic panels, all in tiles ranging in size from 10 centimeters to 3 3/4-inch, featuring manatees, dolphins, and other nature scenes. I photographed it the last time, but couldn’t resist taking pictures again. 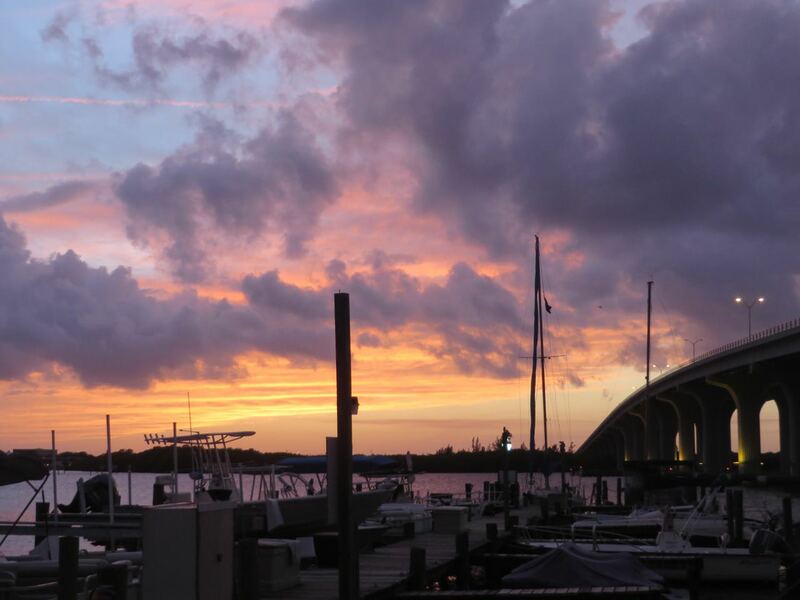 Broadway Bridge in Daytona – the only bridge with real artwork for us boaters to view. 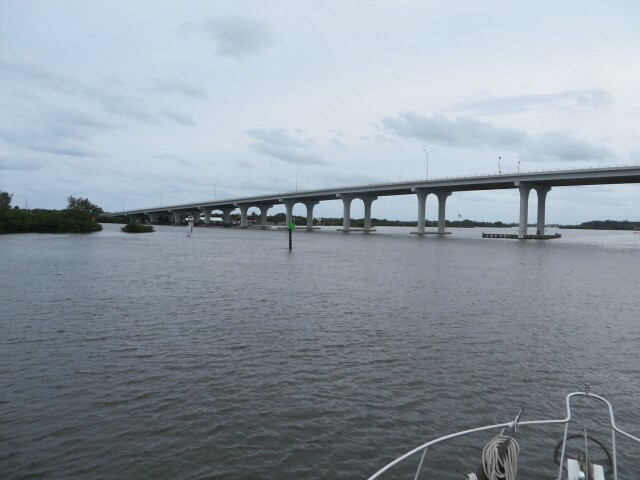 Lee Pharr, the designer, described the story of the mosaics, “The bridge rises and falls so we started with the marine life at the bottom of the bridge and progressed over the bridge with the plant life and animal life. We ended up with the eagle at the top of the bridge.” We have never seen the mosaic work on the upper part of the bridge where cars and people travel, just the lower supports. Maybe someday….. 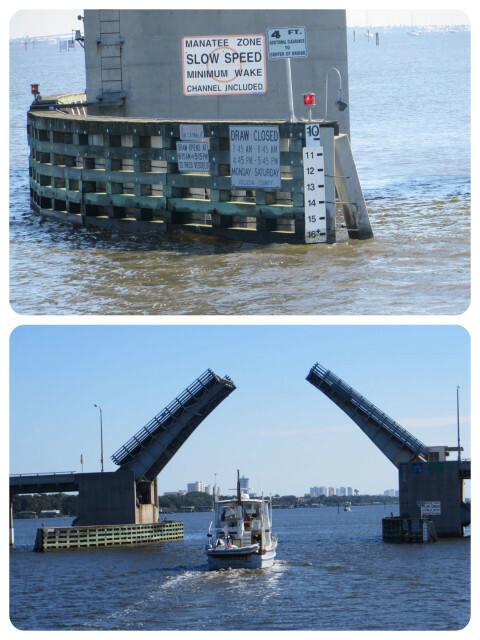 The Memorial Bridge in Daytona is a 21-foot bascule bridge. AND this time we did wait. 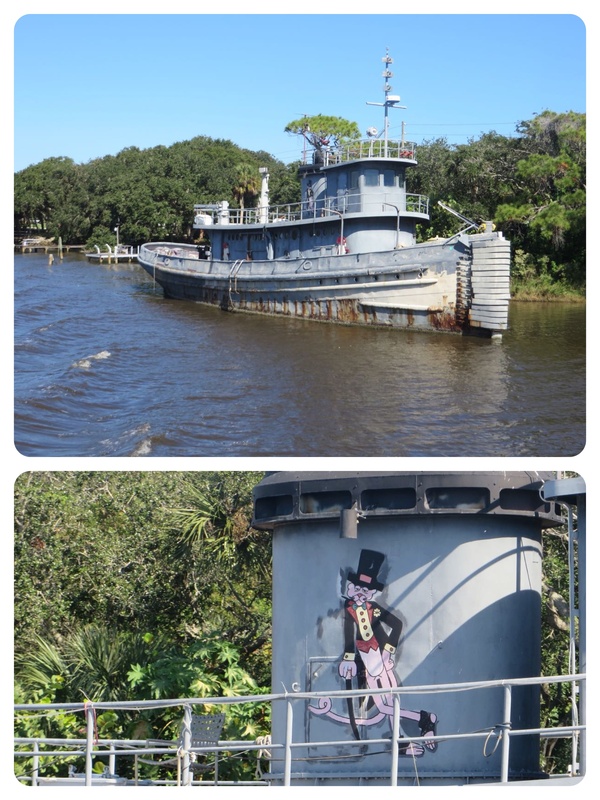 This tug is still docked here right on the ICW. WE looked closer this time and read the name, Tutahaco. She was a large harbor tug commissioned into the Navy in 1945, serving in Puerto Rico and the Caribbean for almost 30 years. Is it someone’s home now? Love the Pink panther touch! With the clocks turned back now, a day of traveling can begin a little sooner (6:30 am for sure) but the light is gone much too soon. We try to be anchored by 4:30 – 5:00 pm. 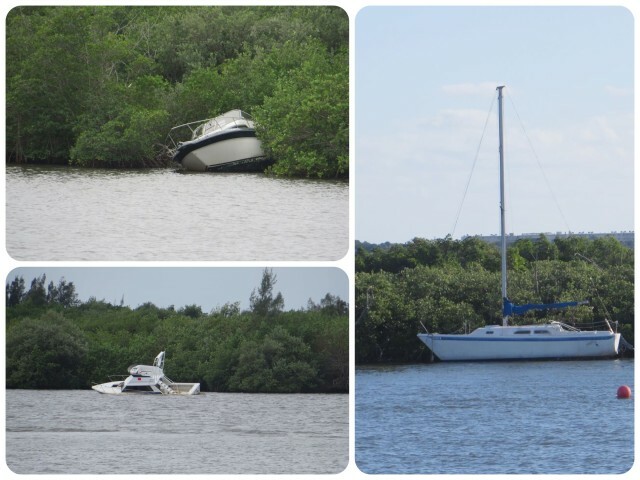 It is surprising to see so many abandoned boats along the sides of the ICW. Surprising and a little sad. These were two of the cutest little boats. Very unique. 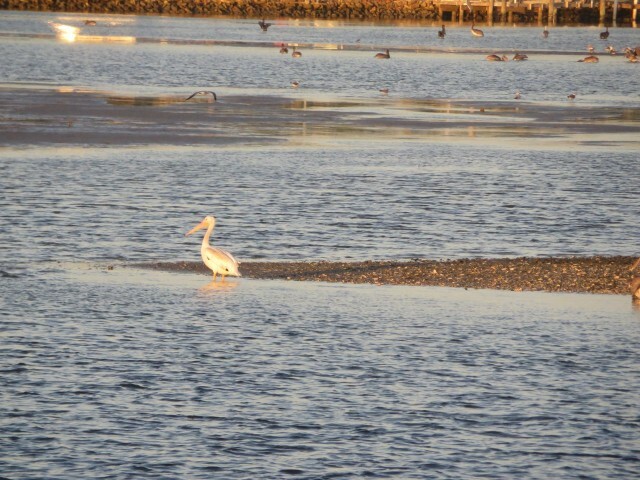 Pelicans everywhere. A group of pelicans is called a squadron, pod, or a scoop.Or in this case, it looked like a convention, in human terms. 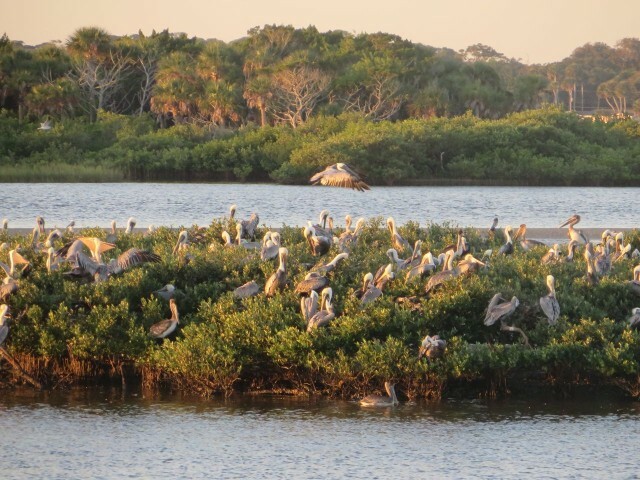 This little spit of an island extended some distance and was covered in a pod of pelicans. A closer look at the pelicans on this little island. 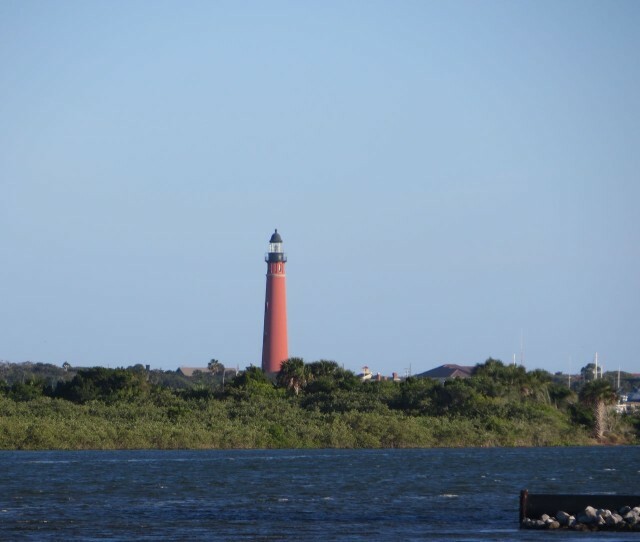 The lighthouse at Ponce de Leon Inlet. 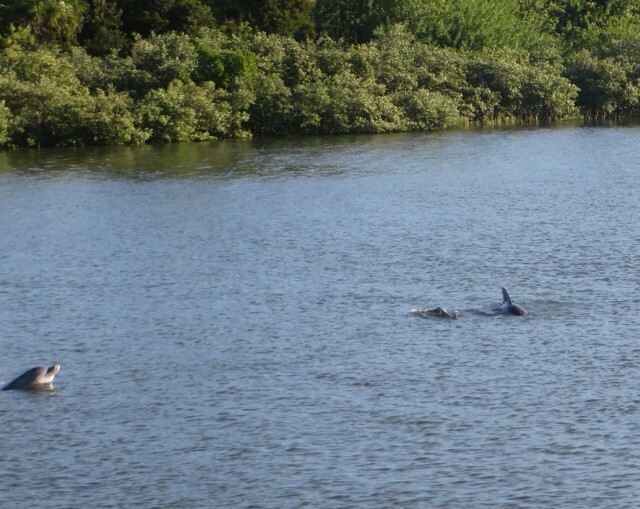 Dolphins are everywhere in the ICW. And we are still enjoying them each and every time. These dolphins were all in one place, around us! I decided it would be worth trying to take a few photos. Look at the dolphin on the left!!!!!! First time I ever caught a photo of a dolphin’s face. Haulover Canal is always fun to transit. It is a manmade piece of the ICW that connects Mosquito Lagoon with the Indian River. It’s a short but nice little passage in the midst of the ICW. 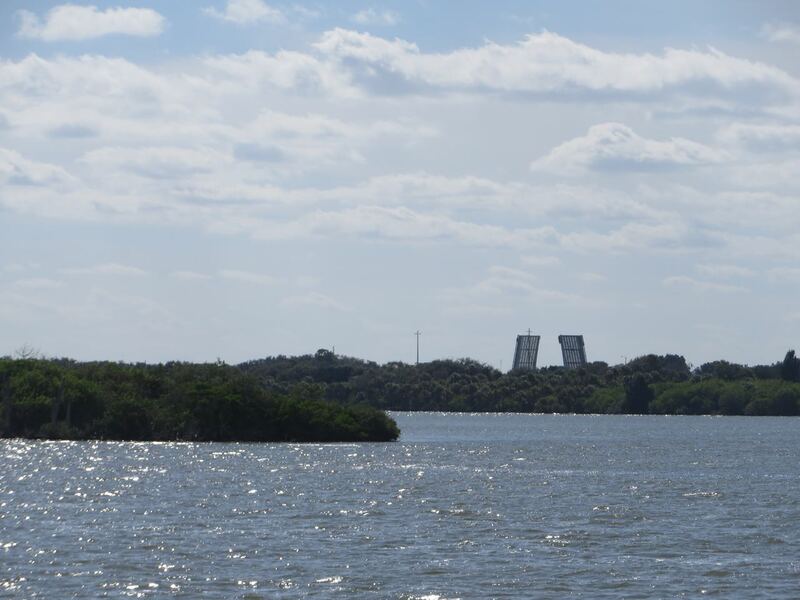 Before the entrance to little Haulover Canal, we could see the Allenhurst (bascule) Bridge opening and closing over tree tops. 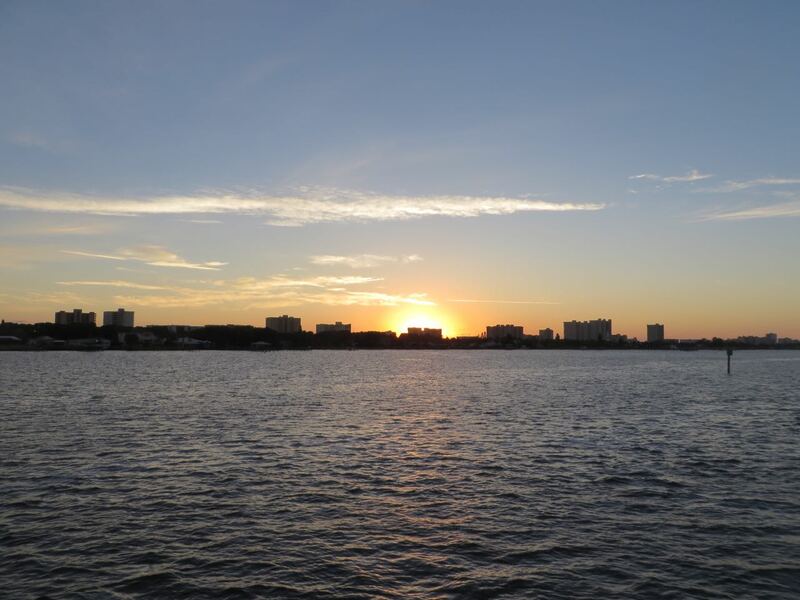 Haulover Canal was a natural location for Native Americans and settlers to portage or “haul over” canoes and boats between the Indian River and Mosquito Lagoon, two larger water regions. The first canal was hand dug by slaves and was only 3 feet deep. It was deepened and widened twice more in 1884 and the 1920s until the Army Corps finally blasted the coquina rock to its current depth. Taking the sharp right turn to enter Haulover Canal behind another trawler. 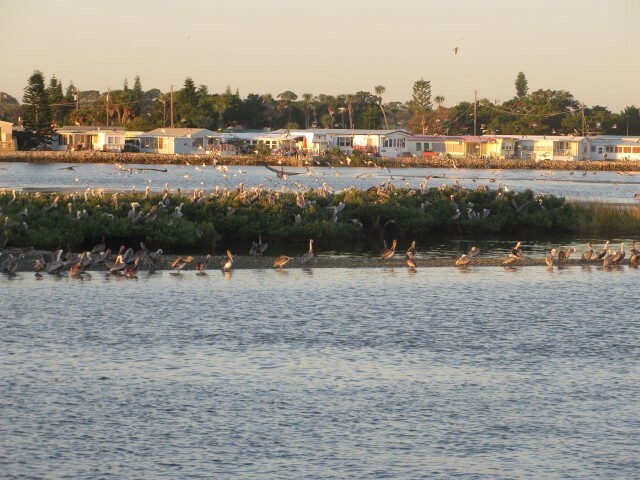 Haulover is known for great fishing. 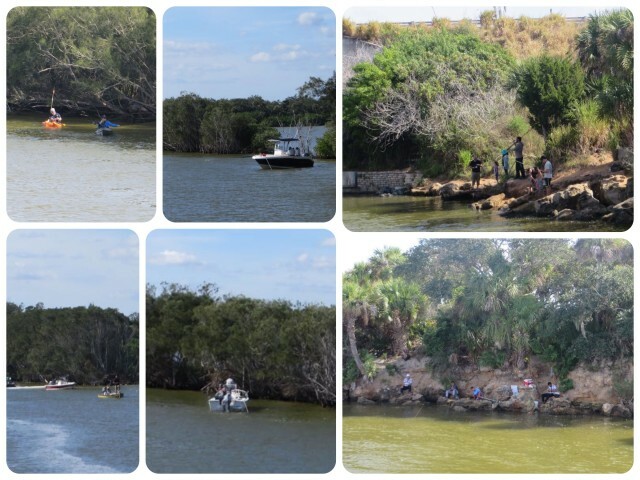 Since it was a Saturday, and a beautiful day, there was a whole lot of fishing going on – on the shore, in boats, in kayaks. Good-bye Haulover Canal and Allenhurst Bridge! 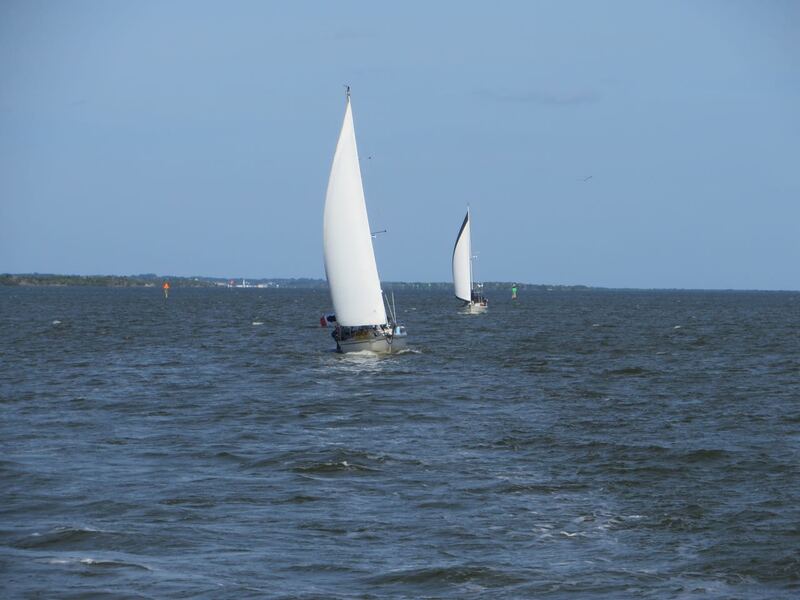 Sailboats behind us taking advantage of the good breeze. We do miss those moments of moving along swiftly and quietly with the breezes. 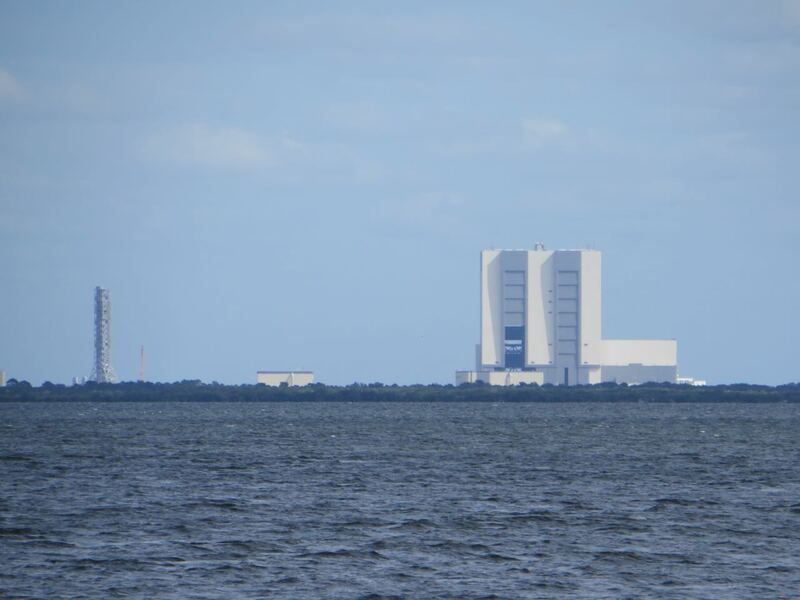 The Kennedy Space Center off in the distance, but clearly visible from the ICW. Anthony scooted over by dinghy to say hello in person and snap a pic for Facebook. 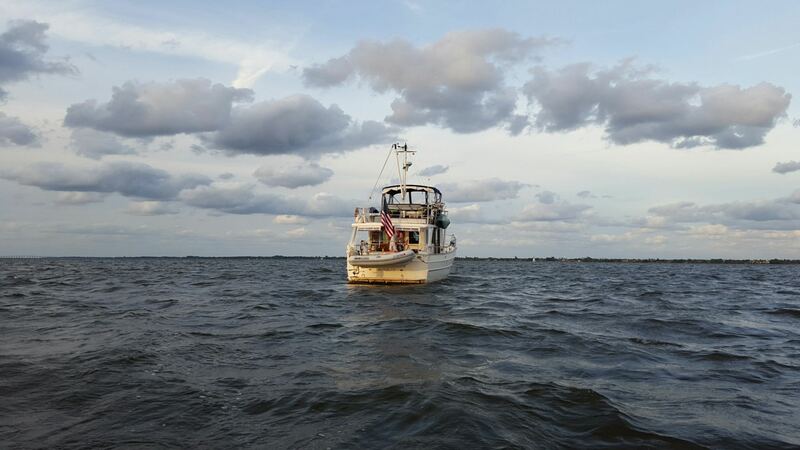 Kindred Spirit anchored in Eau Gallie. We weren’t that alone – there were plenty of sailboats there for the SSCA GAM. Last day of the journey to Vero Beach was a shorter day. 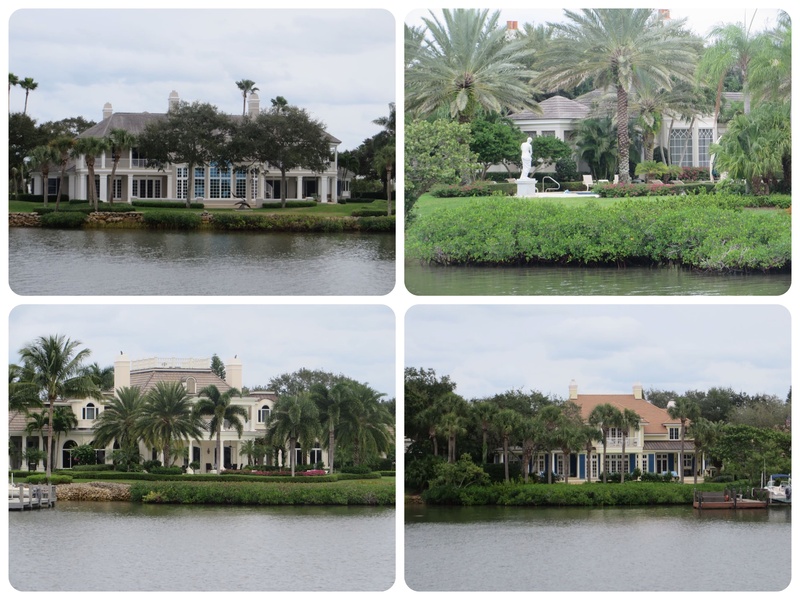 We had already done a 6.5 hour day , followed by a 10-hour day, so we expected to be in Vero within 5 hours. 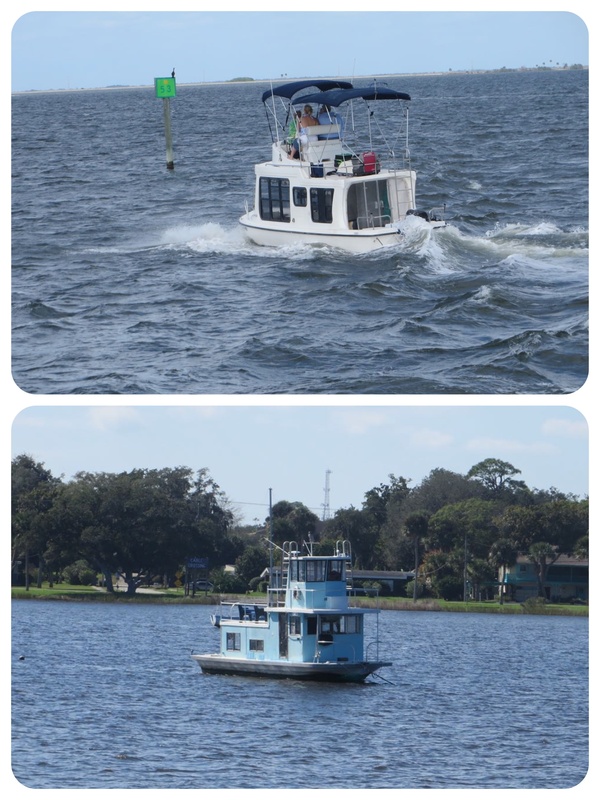 There are many, many boats to oggle and gawk at on the ICW, and this one was definitely one of a kind. At least we thought it was one of a kind until we saw something very similar under construction just a short way beyond. 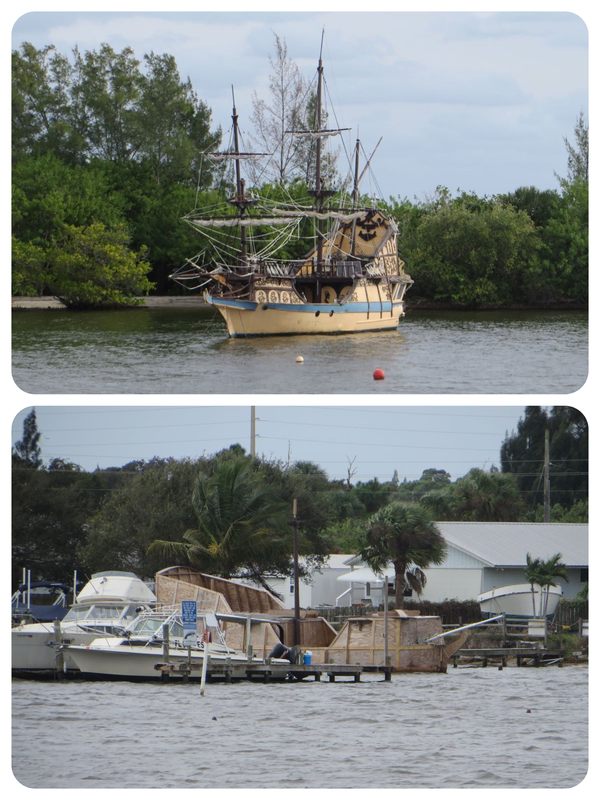 Hmmm, anyone want a pirate boat of their very own?? ARGHH! The ICW can be quiet with just nature along each side. And then there are some sections where man has definitely had an impact. 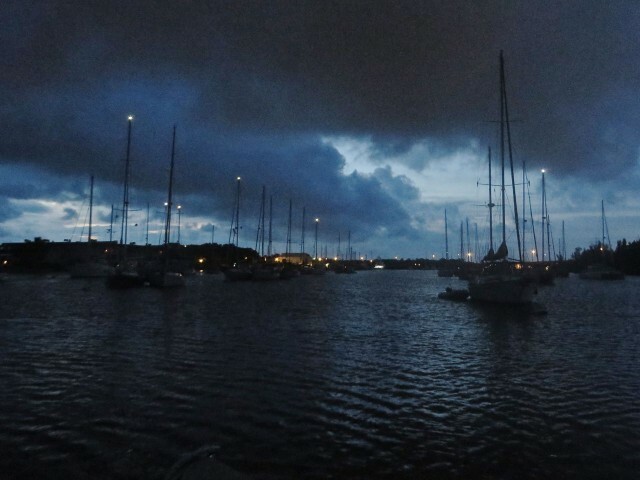 The approach to the Vero Beach City Marina was disconcerting the first time we arrived here. 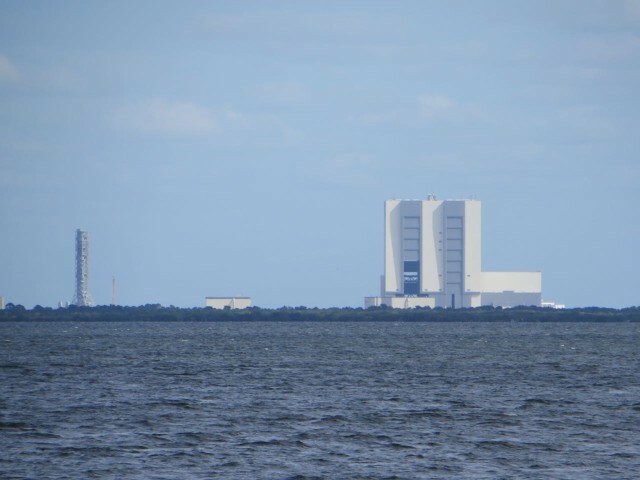 You know it is supposed to be there, somewhere, but it feels like you are going to hit the bridge before you can make the turn into the little harbor. It’s not as bad as it looks on the chartplotter. Gotta trust your eyes more than the plotter. 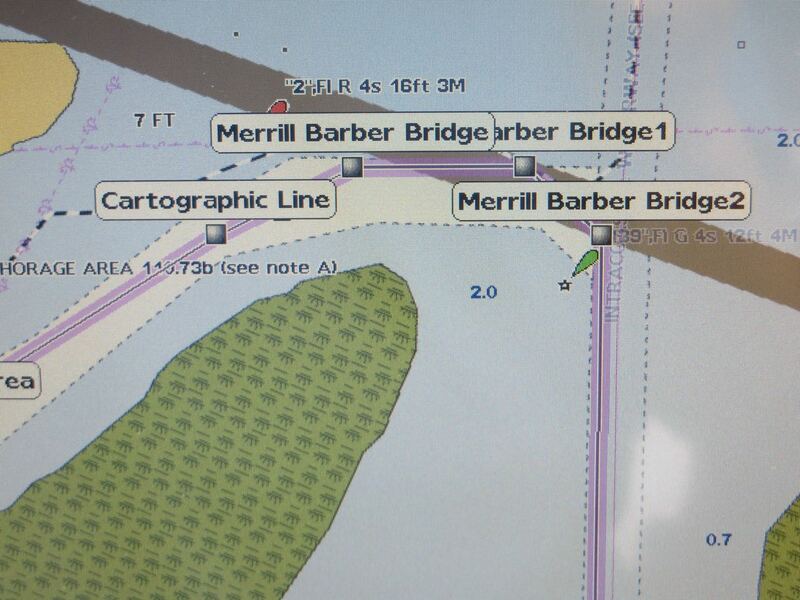 Following the markers on the chart plotter looks like we will go under the bridge or hit the bridge. 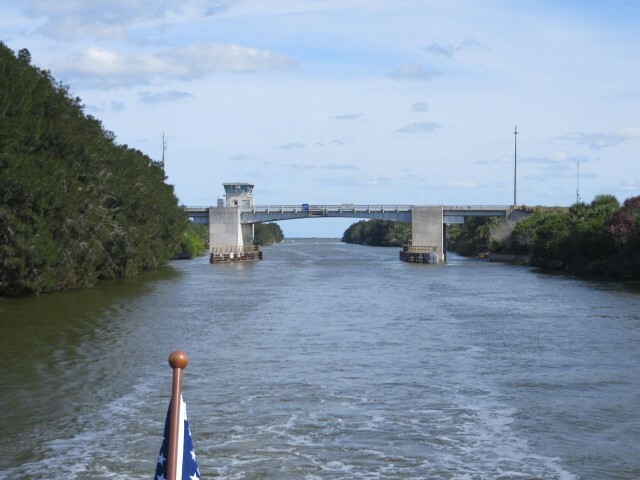 Making our port turn towards the entrance to Vero City Beach Marina. Easy once you know what to expect. And here we are – a wonderful déjà vu! Rafted together again on a mooring in Vero Beach with Cutting Class and san cles. Just like 2013, we are having an SYC reunion. We are going to have FUN. 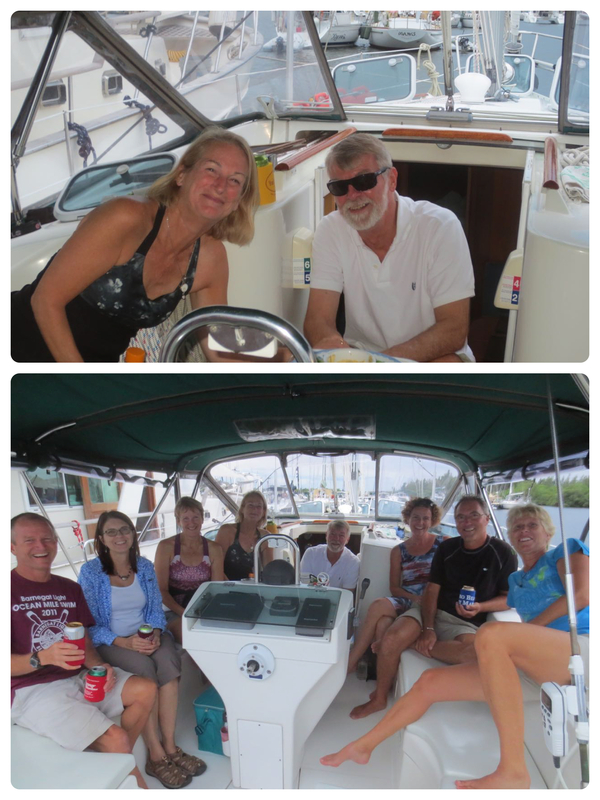 SYC boats and cruisers together again – Al, Michele, Sue, Dave, Marcia, and Dan.